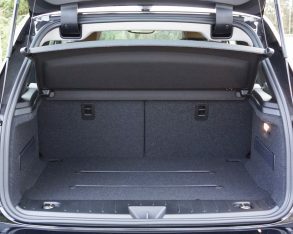 efficient package, why not? 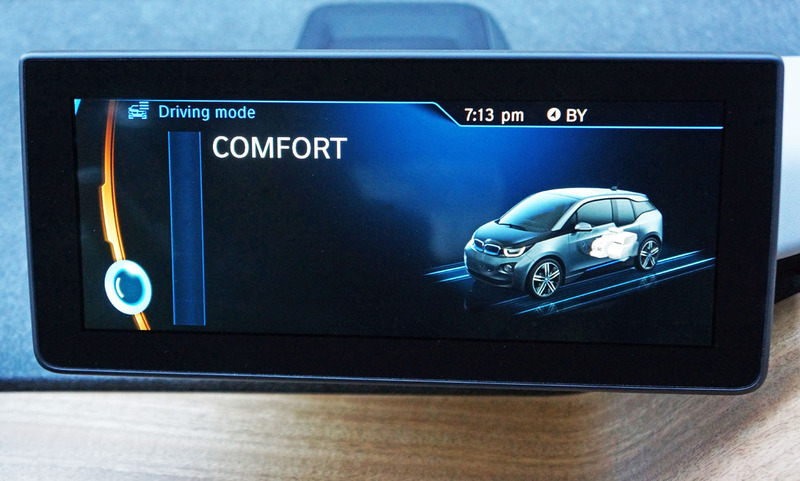 Compact luxury has long been a big thing in Europe and other markets where road and parking space is limited, so it’s refreshing to see Canadians warming up to the idea too. 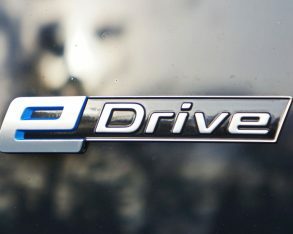 BMW was actually a forerunner in this respect, not only delivering a compact car with premium levels of materials quality, fit, finish and features, but also making its 1968 2002 brilliantly fun to drive. 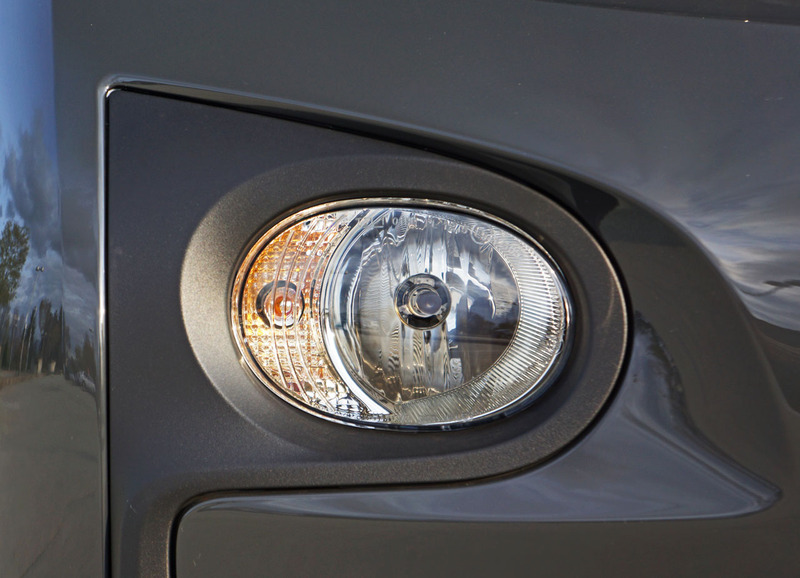 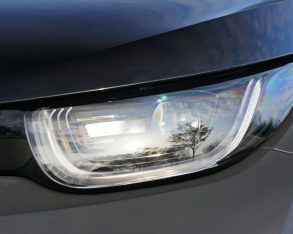 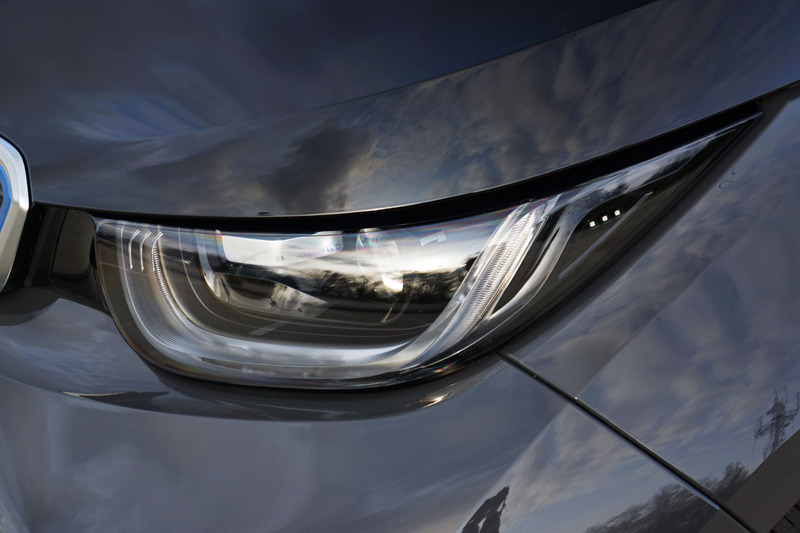 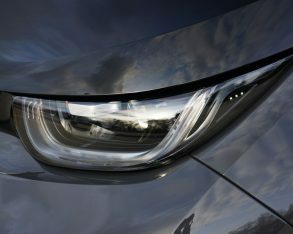 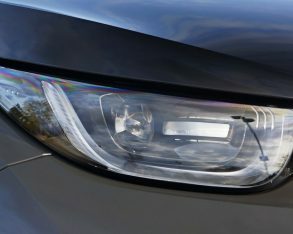 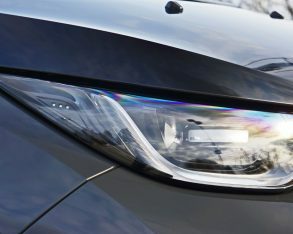 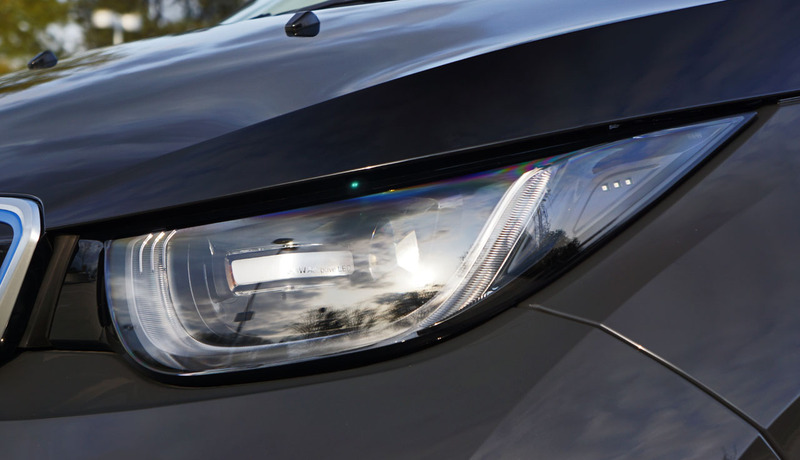 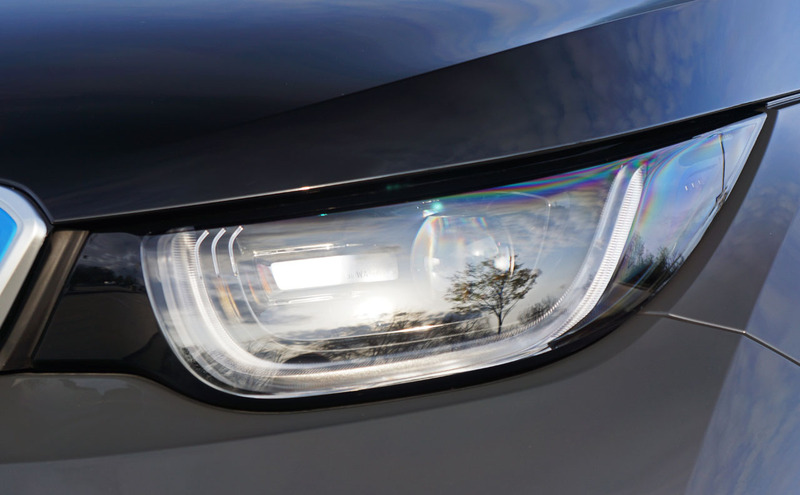 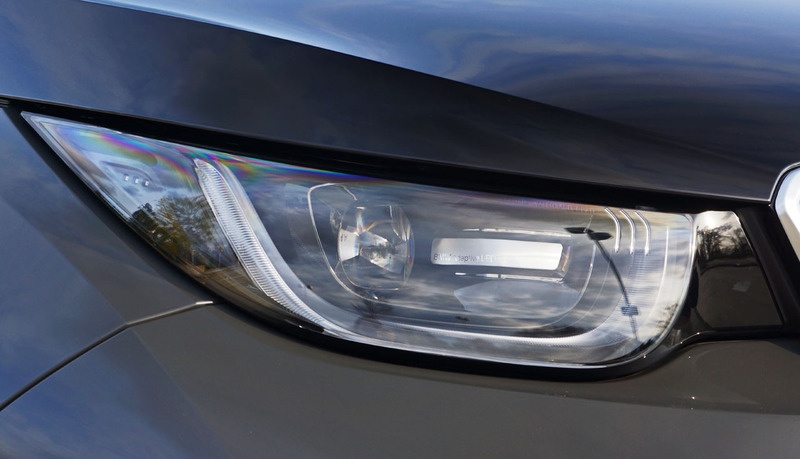 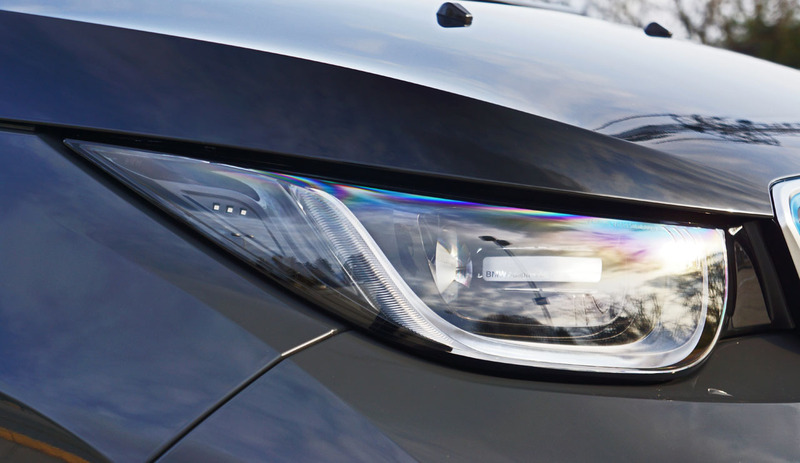 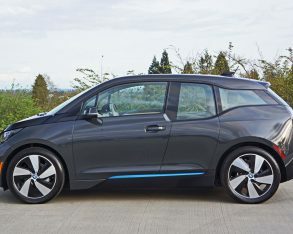 This philosophy has since underpinned every entry-level car the company has produced, so it only makes sense that it would continue with the brand’s first foray into small, efficient electrics. 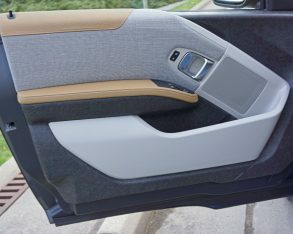 doors should. 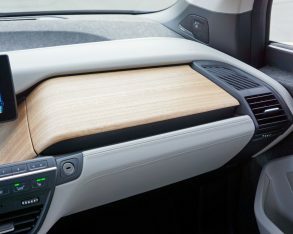 It helps that my tester was fitted out with the model’s alluring mid-grade “Lodge” interior, replete with a gorgeous open-pore eucalyptus wood dash top (sourced from Europe under strict forestry management policy) designed with Bauhaus-style minimalism. 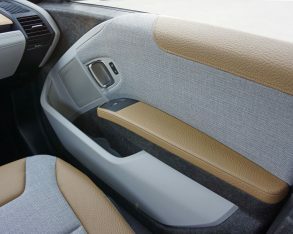 Or maybe it’s more Danish-inspired? 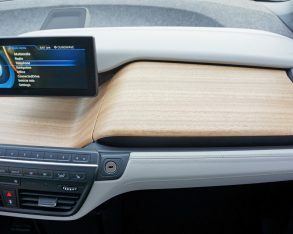 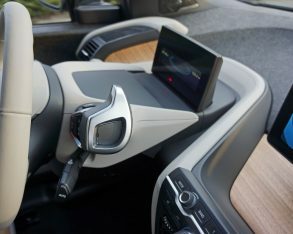 Either way it’s a mid-century furniture nut’s dream car, and being that I fall into that trendy category I immediately fell in love with the i3’s layered interior design. 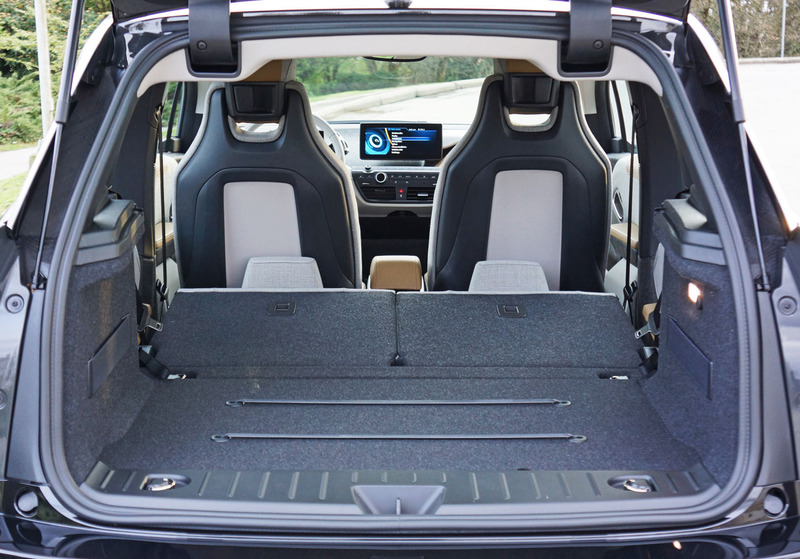 It might be a small car, but the i3 feels more spaciously open than anything this side of a panel van. 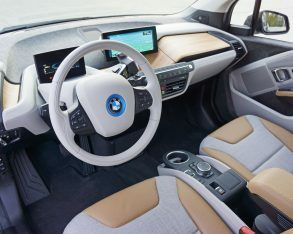 has entirely rethought personal transportation, the only thing lacking from being a future-think sci-fi movie prop is full automation, although I’m guessing it’s wired for that too. 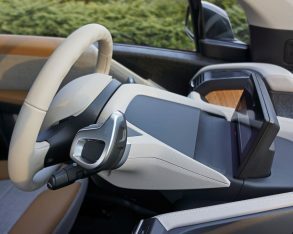 It’s a concept car, but it’s real. 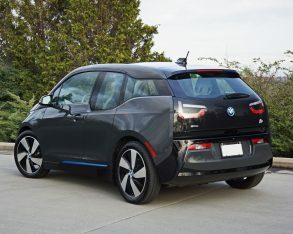 A BMW art car, although unlike the brand’s many classic rolling canvases painted by legendary artists, the i3 is 100-percent modern geoform. 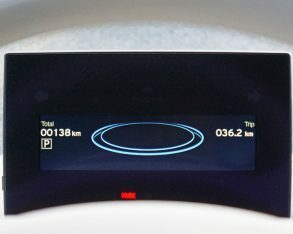 Its creatively shaped greenhouse maximizes outward visibility without care or concern about linear flow, a design element in sharp contrast to the softly curving multi-layered effect of the aforementioned instrument panel. 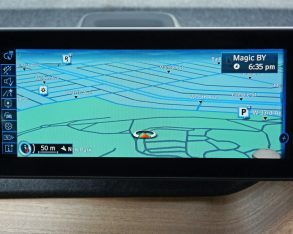 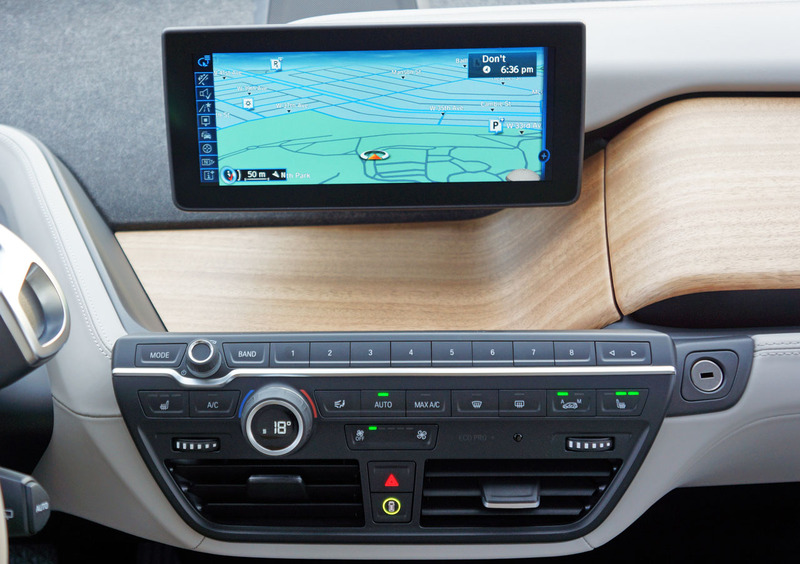 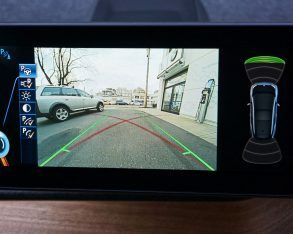 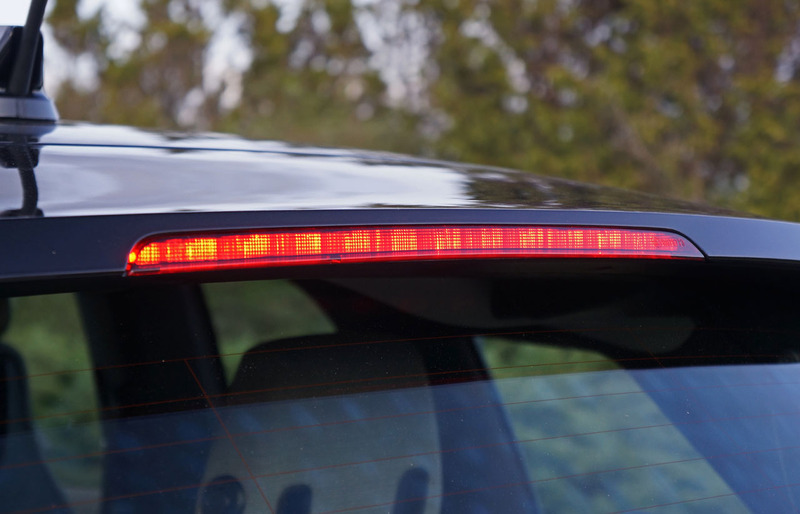 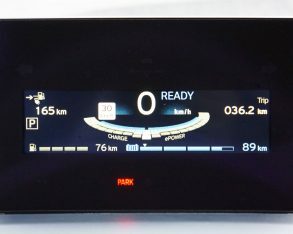 The latter gets topped off with a set of perfectly rectangular digital displays, the first, about the size of a common tablet, used for primary instrumentation and the second, slightly wider, housing the infotainment system. 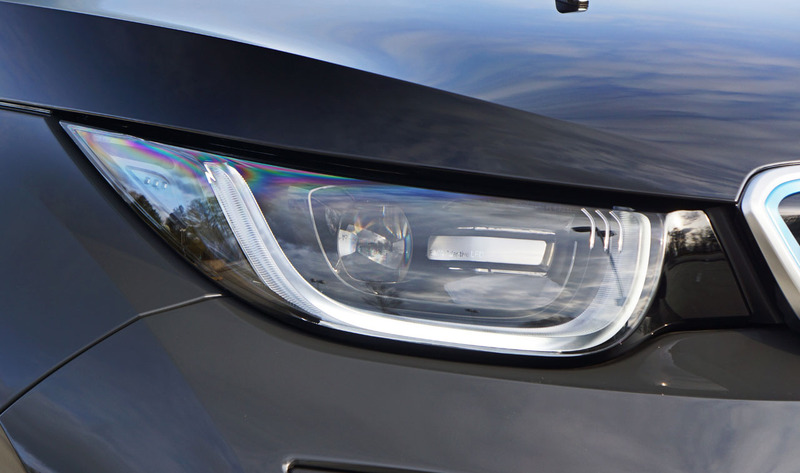 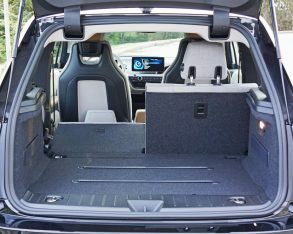 As with all BMWs, the graphics are best of the best, but to dwell on this instead of delving into what really makes the i3 special would be wasting space. 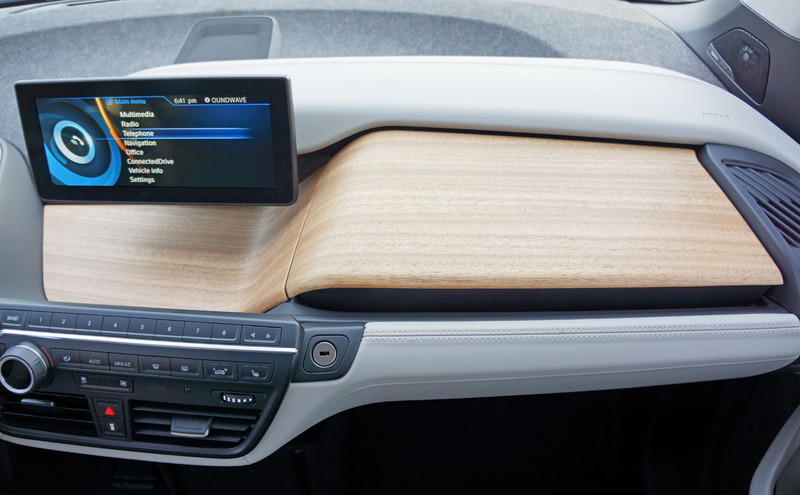 textures and materials, earth tones, raw and real, reclaimed and recyclable. 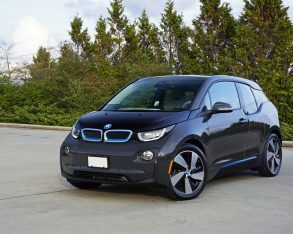 It’s the greenest car on the planet, and I’m not talking colour. 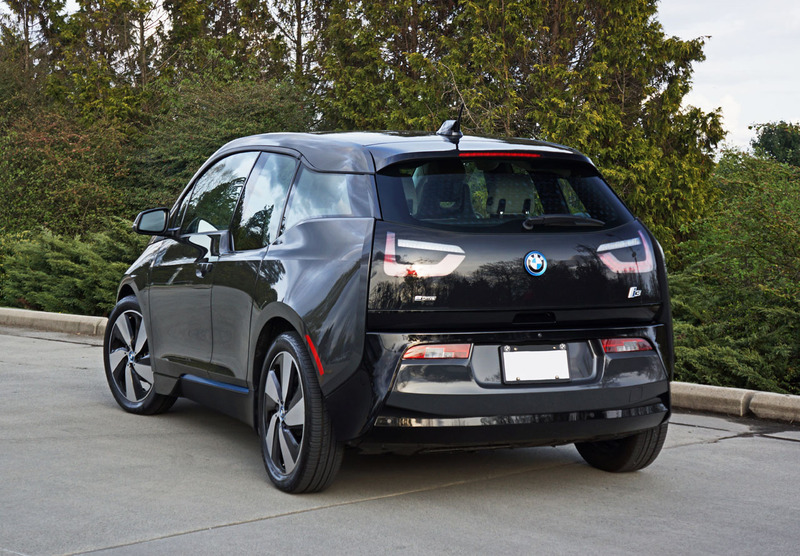 You can’t even order an i3 in anything remotely resembling green, albeit Arravani Grey has some green undertones visible on a cloudy day in the right light; or was that Laurel Grey? 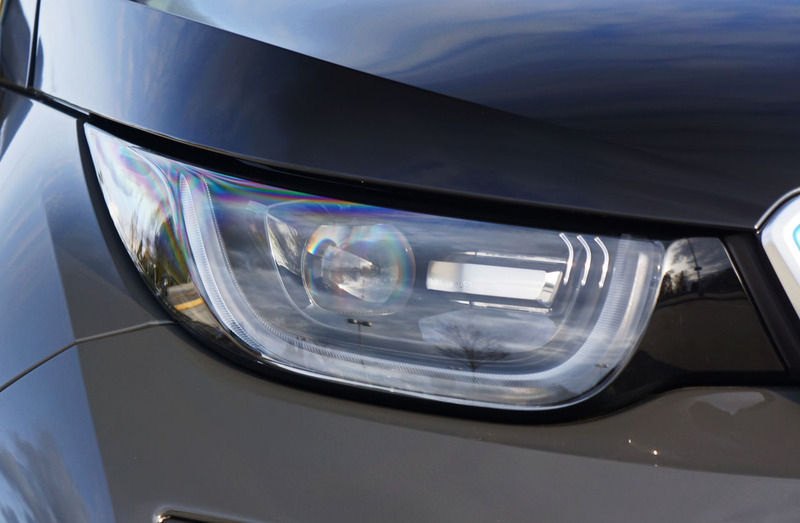 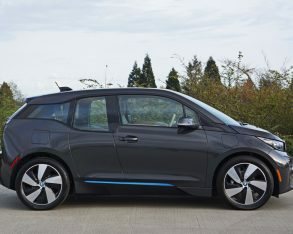 In BMW tradition there are two greys and two silvers, plus white and something a little bolder for those wanting to stand out from the crowd, if the i3 doesn’t do this well enough without an attention getting colour. 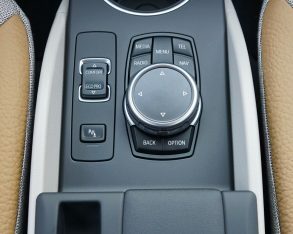 Solar Orange Metallic begs for attention, mind you, plus it’s the only hue not complemented by Frozen Blue accents. 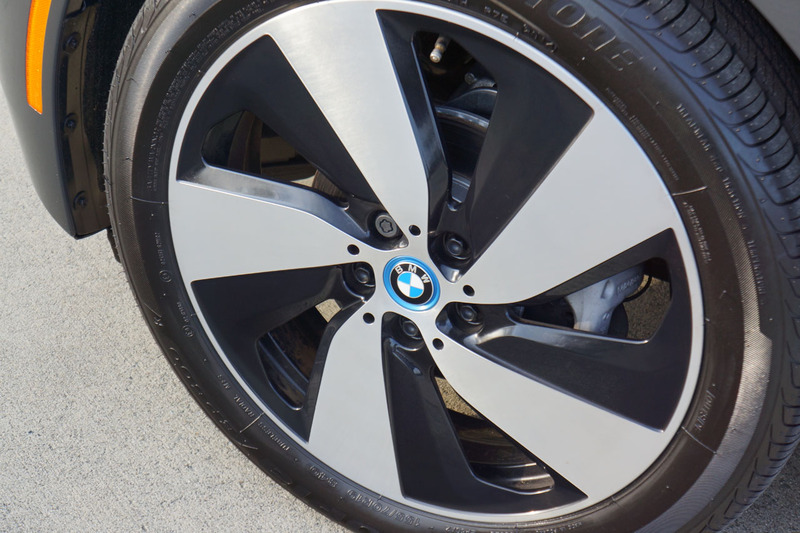 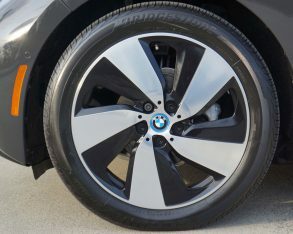 each roundel, while it featured 19-inch Turbine light alloy wheels wrapped in 155/70 front and 175/60 rear rubber for a sportier look than the base “Loft” model’s Star Spoke rims, the Turbines standard with aforementioned Lodge trim. 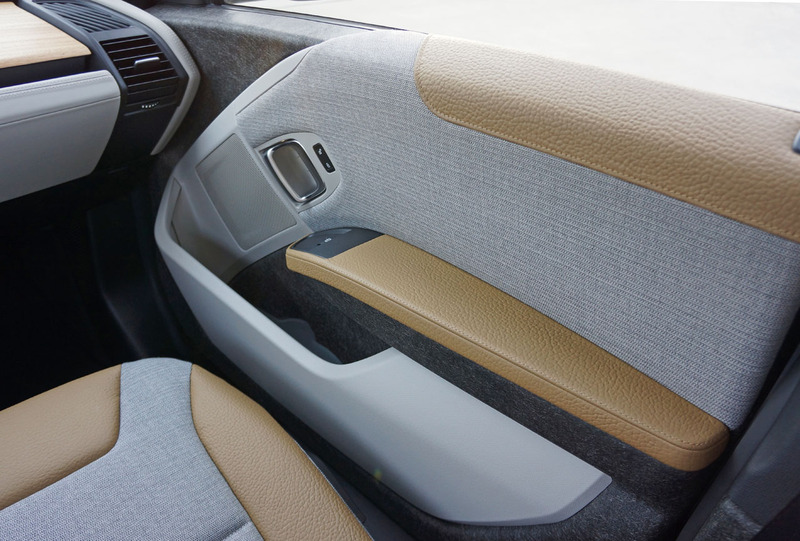 of the weight of the plastic used for other surfaces come from recycled material or renewable resources. 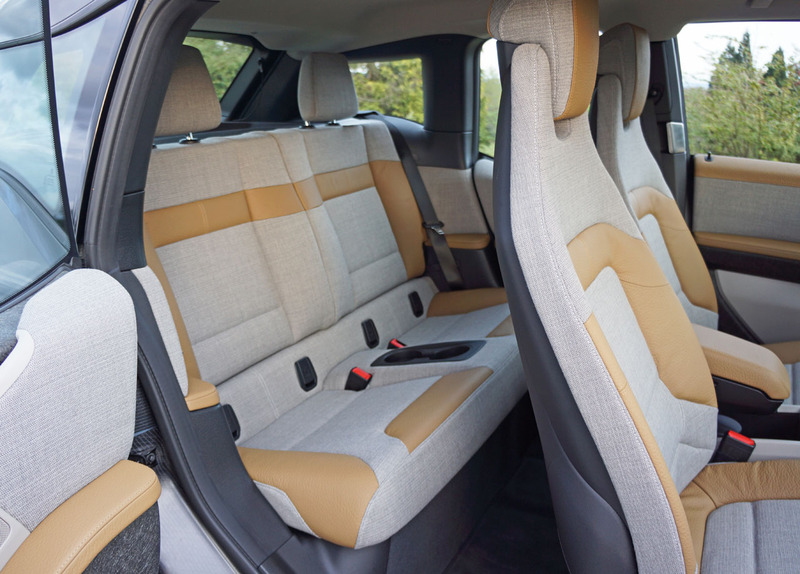 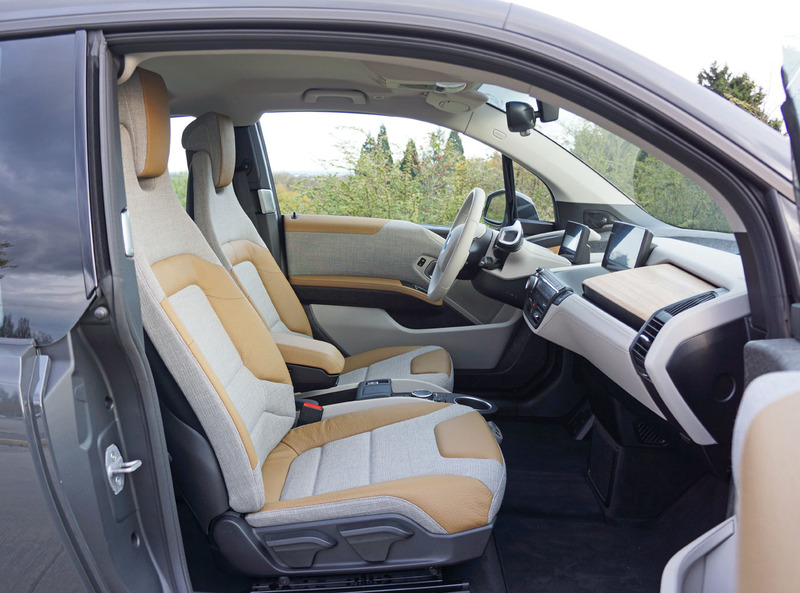 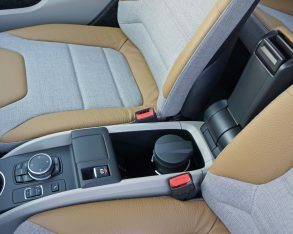 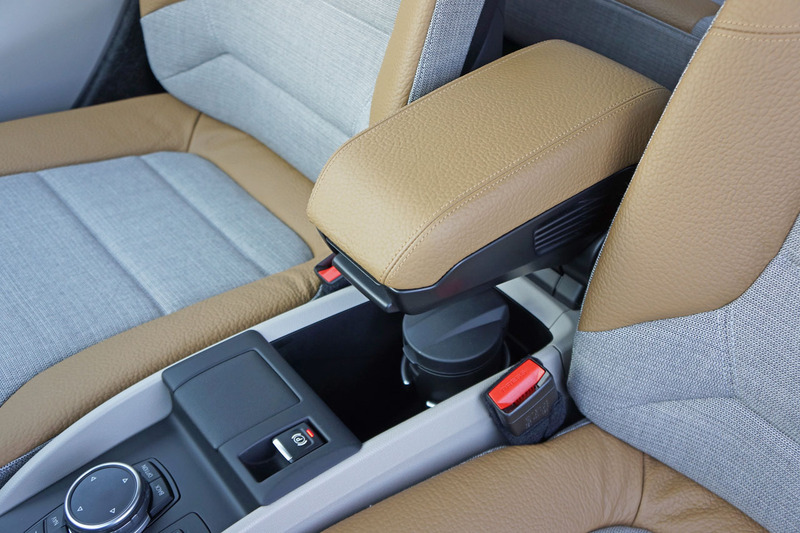 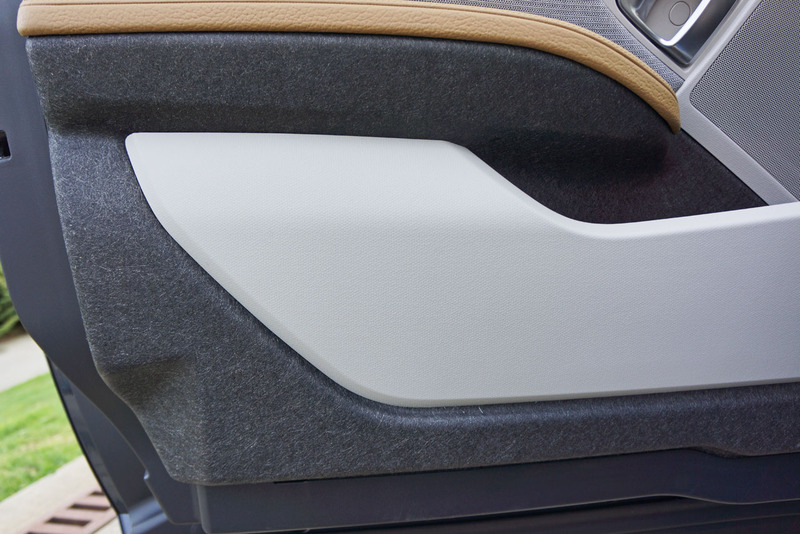 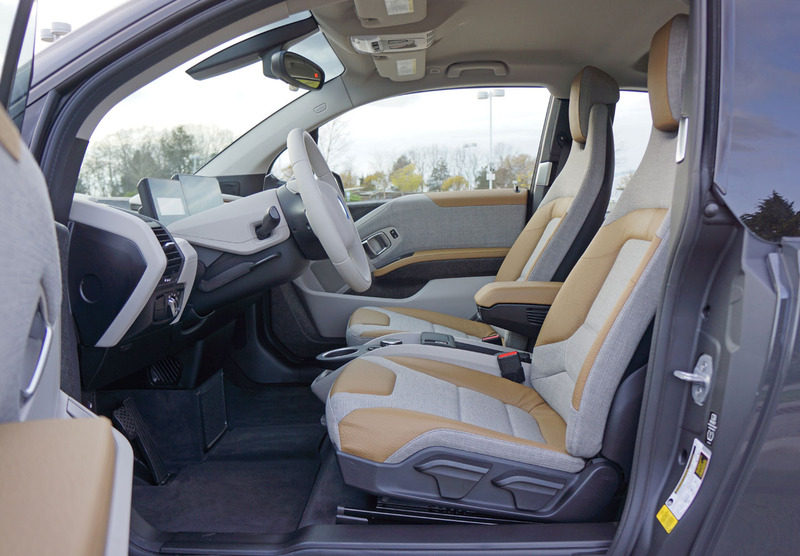 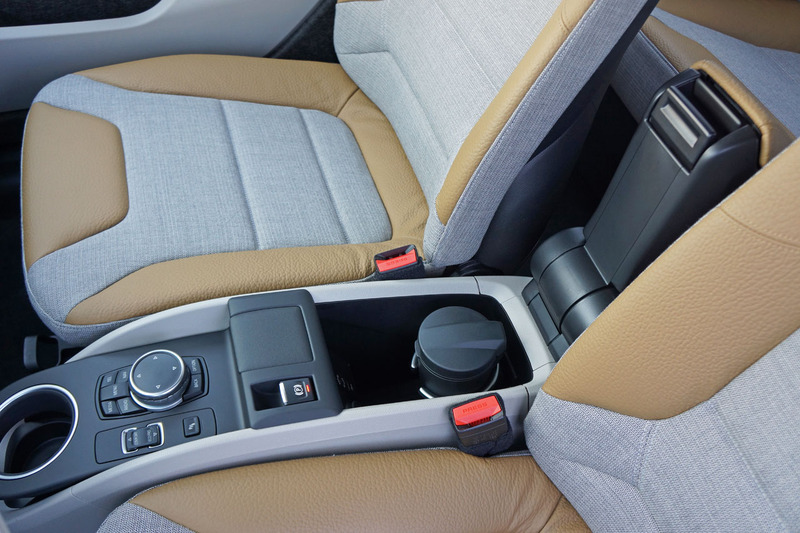 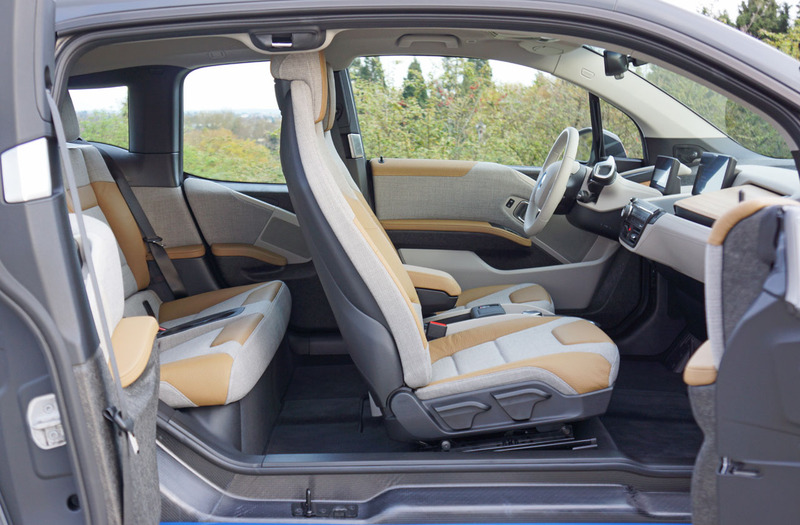 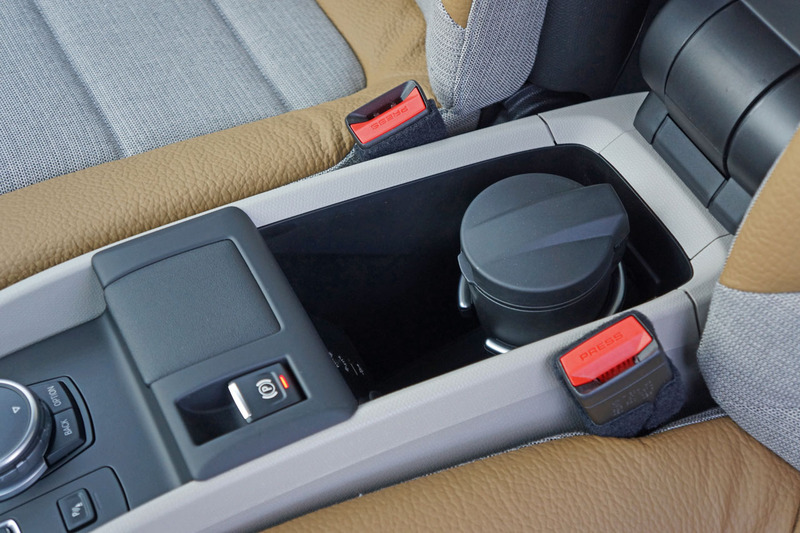 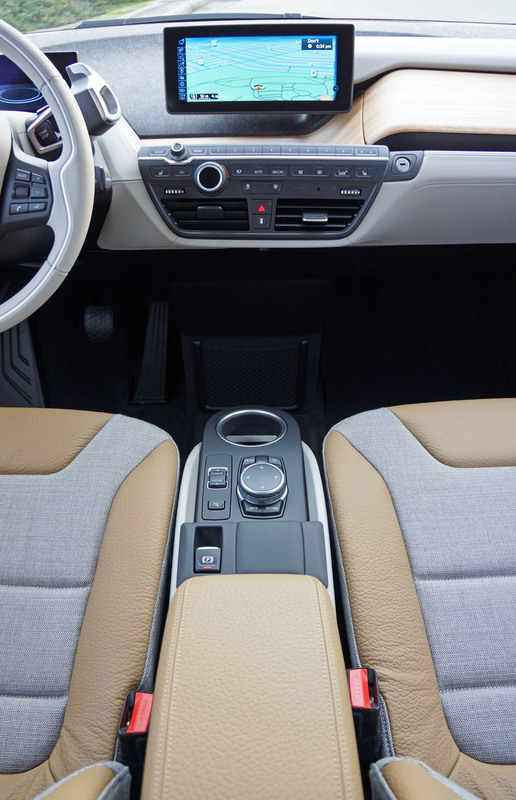 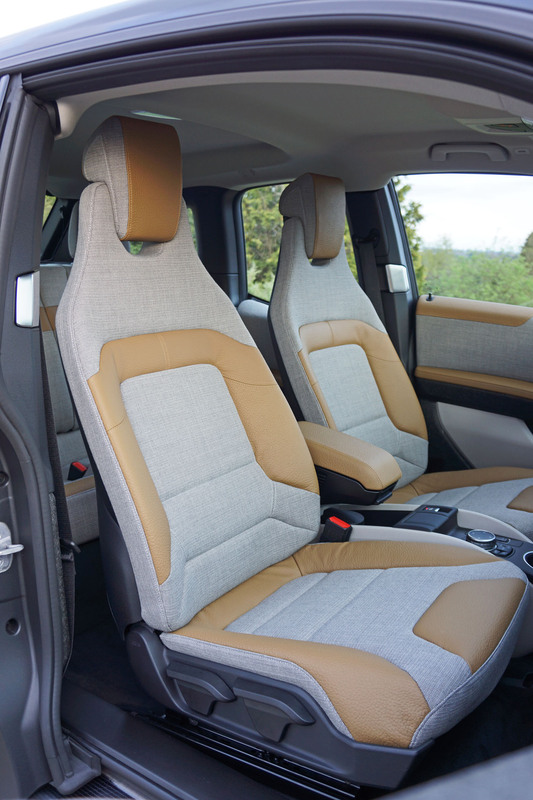 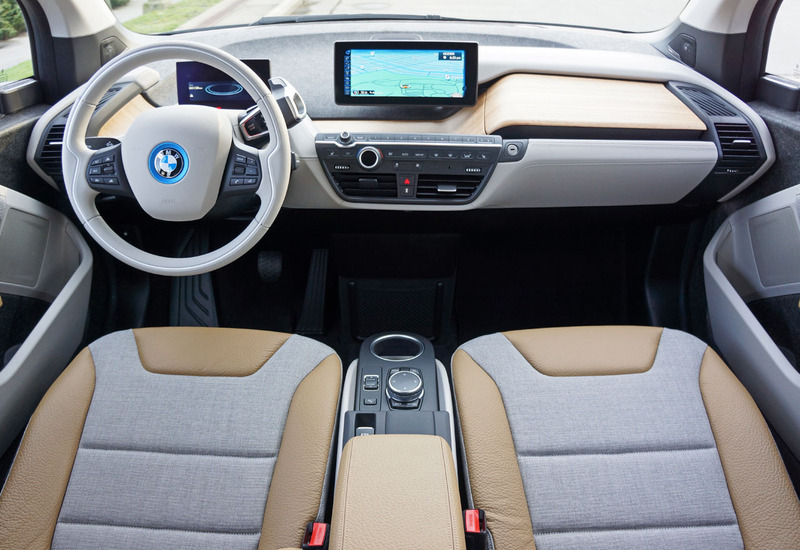 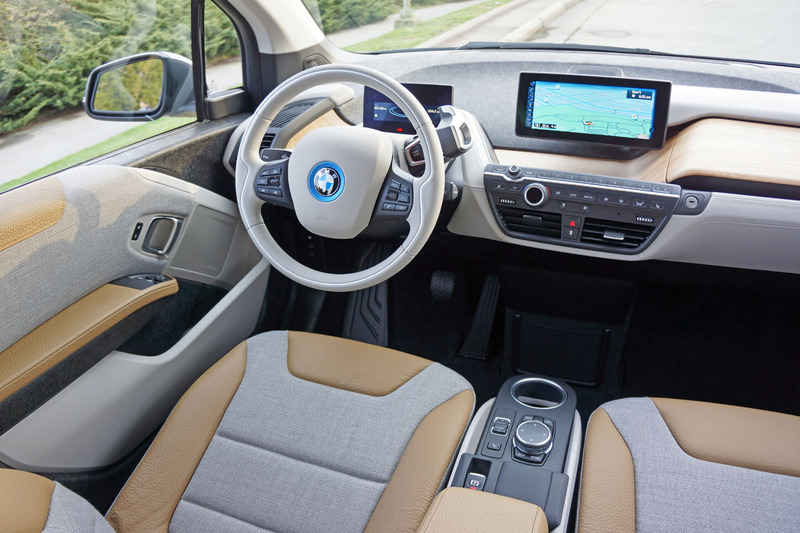 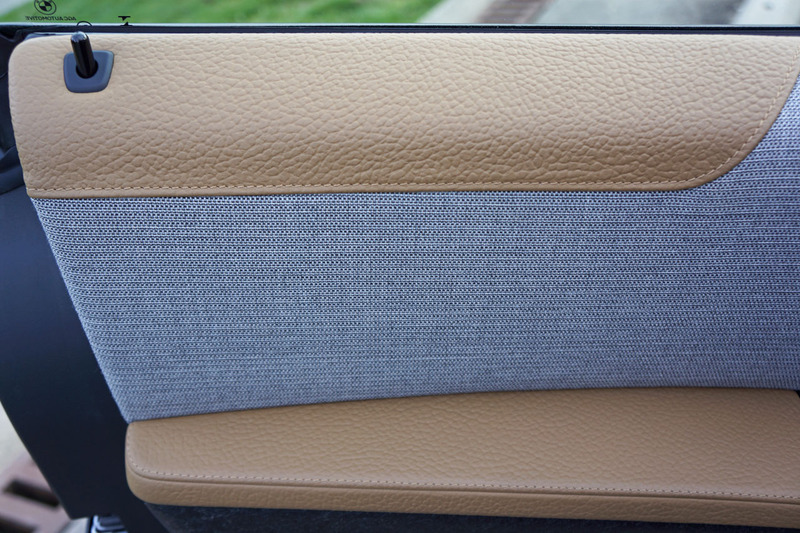 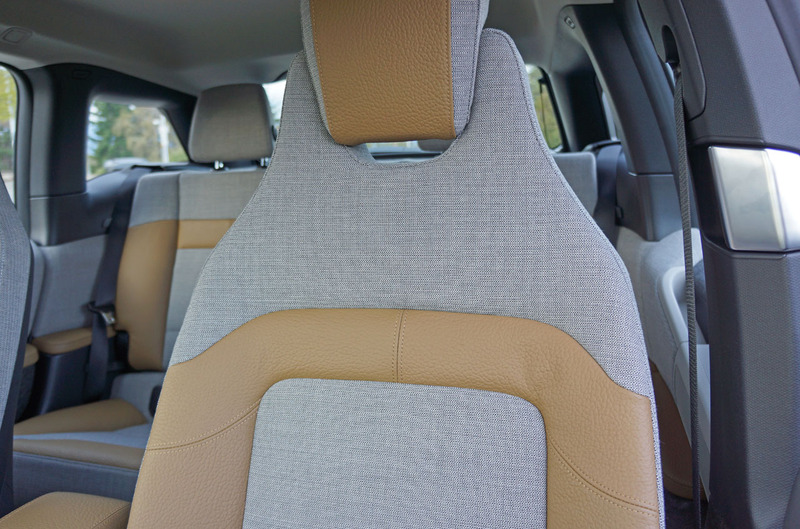 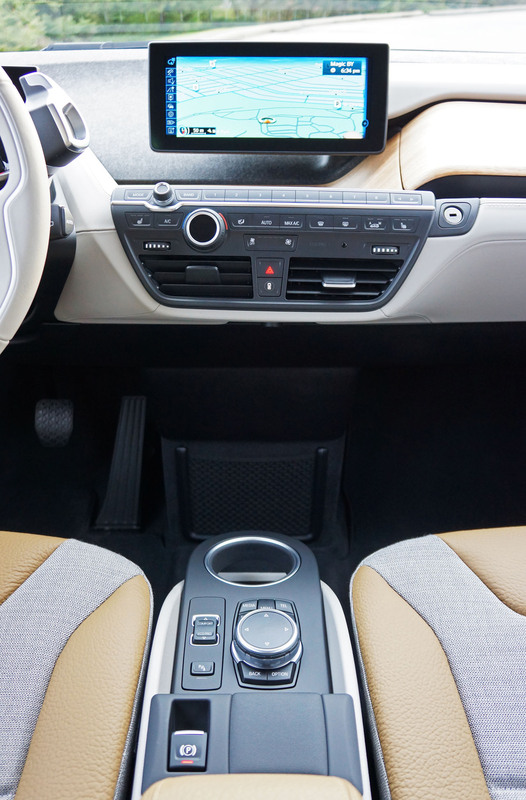 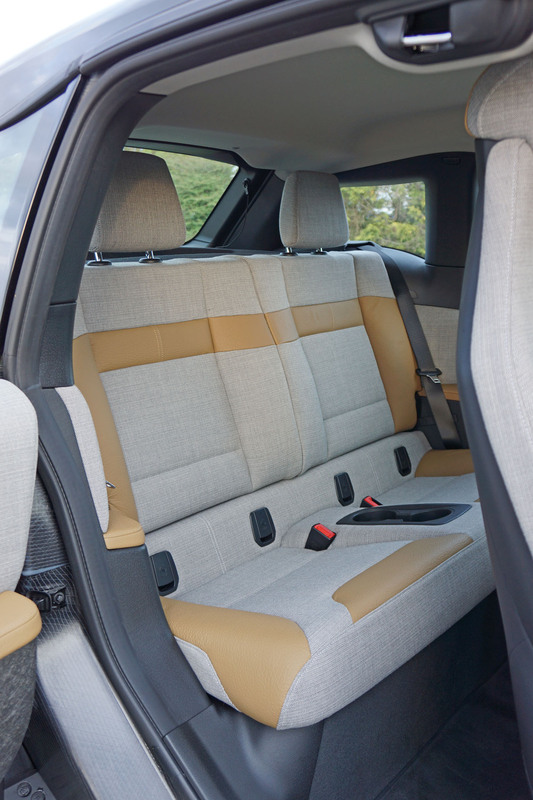 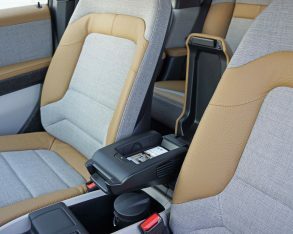 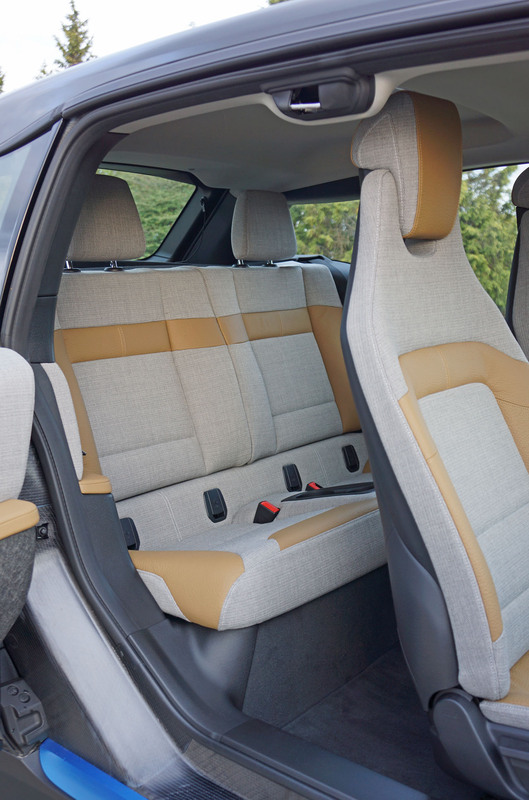 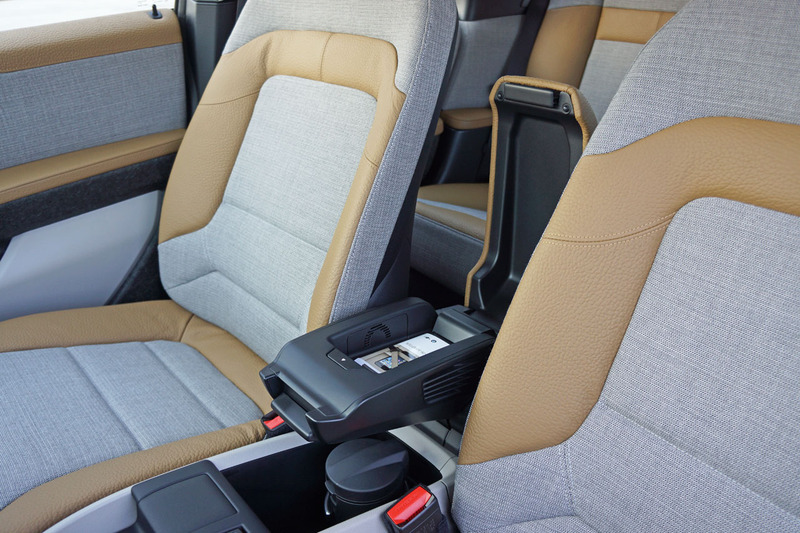 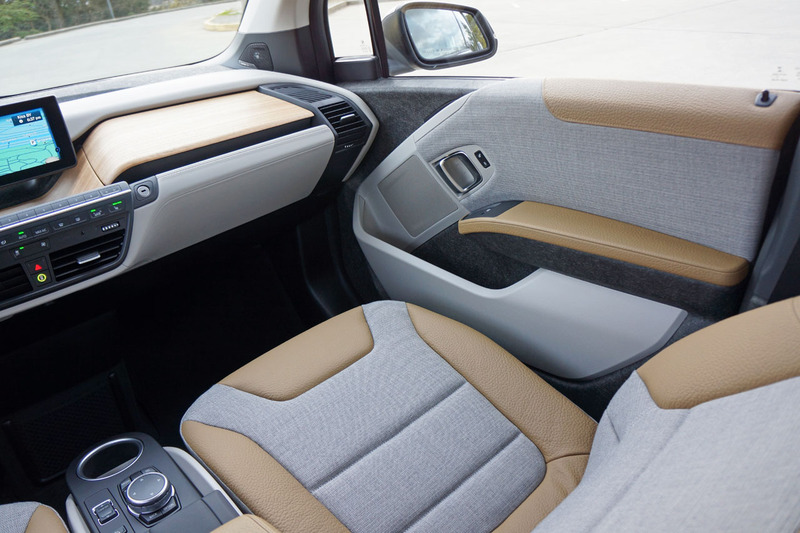 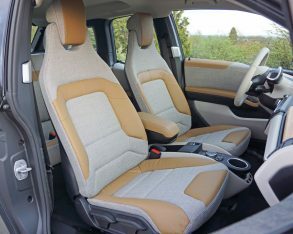 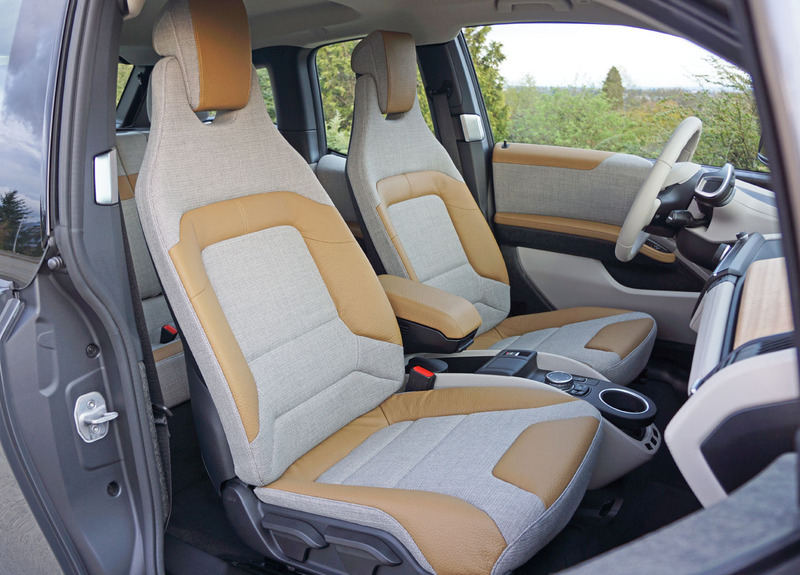 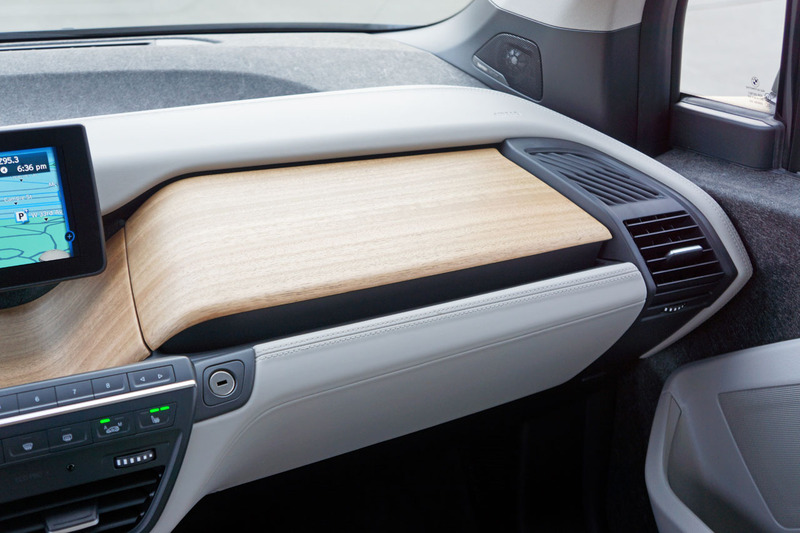 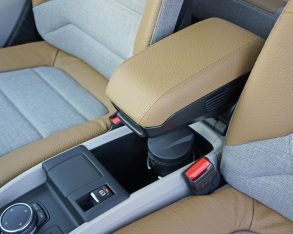 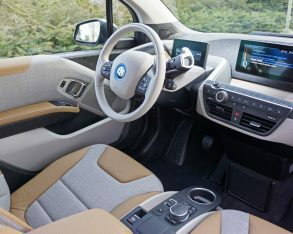 All materials, including the high-quality leather and climate-active fabric upholstery looks as if it’ll last long after the i3’s sheetmetal has corroded away into piles of red dust, although that process will never occur as rust is something this little car can’t do. 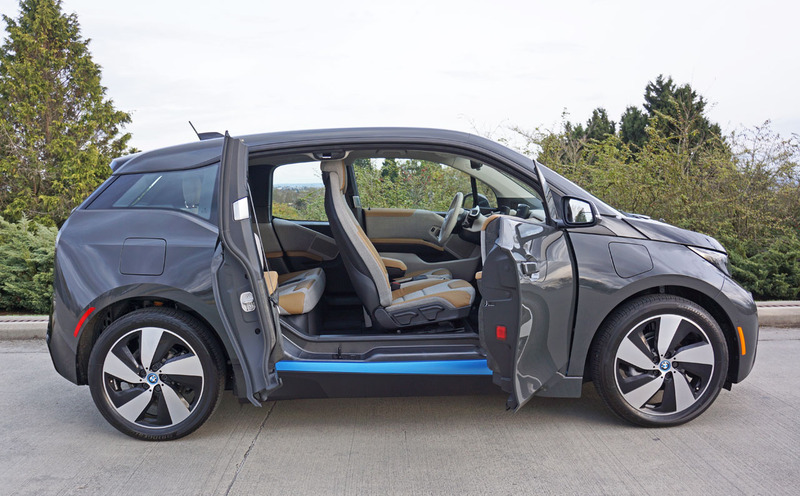 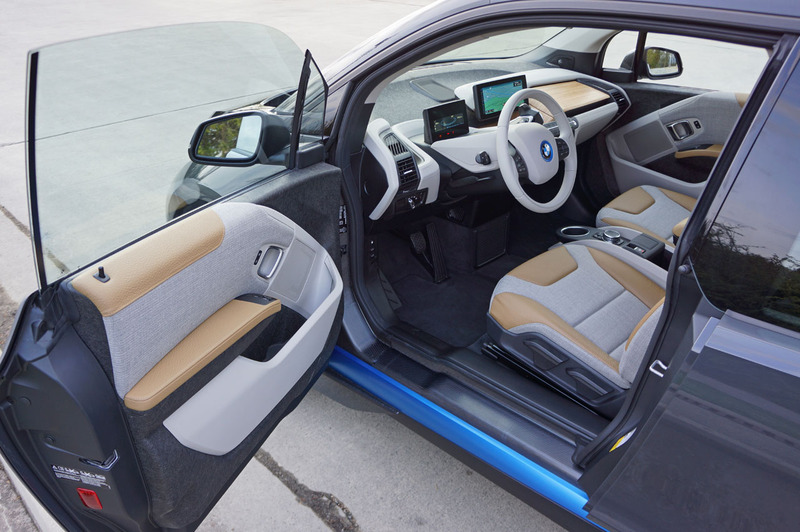 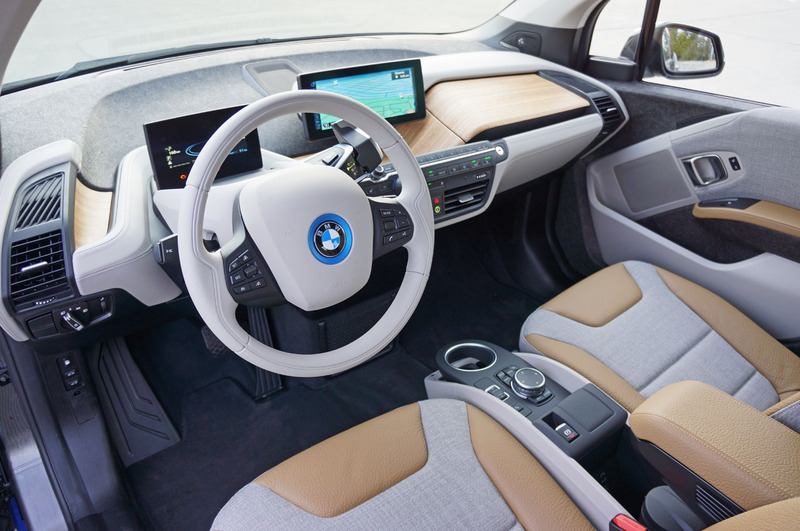 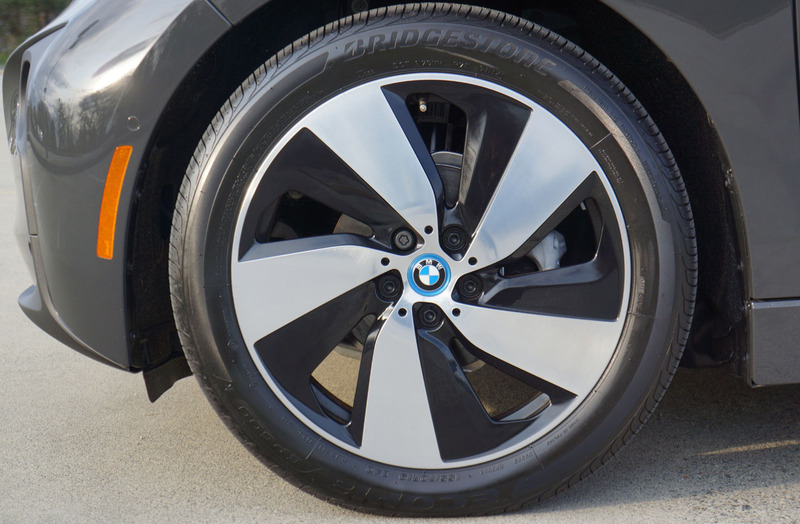 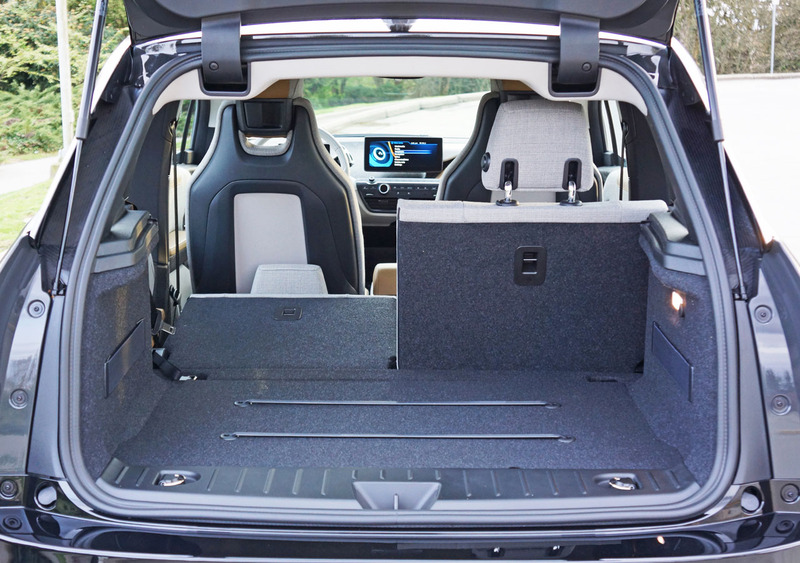 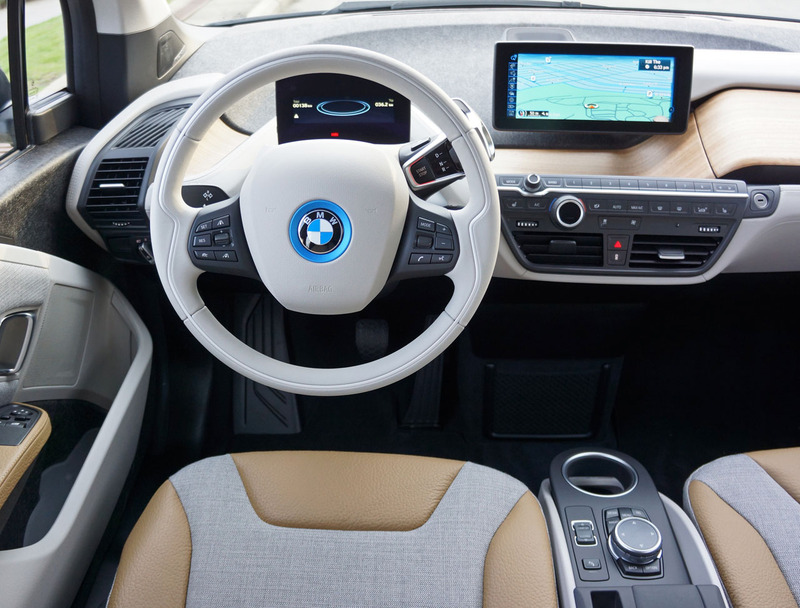 aluminum alloy was chosen, combining for an ultra-light chassis and extremely stiff, lightweight body shell, the i3’s 1,195-kilo (2,630-lb) curb weight aiding efficiency and overall rigidity benefiting handling and safety. 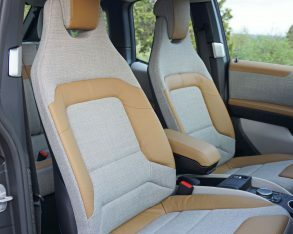 the experience. 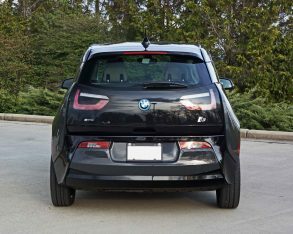 The i3’s charge from 0 to 20 km/h is actually quicker than the 425 horsepower BMW M3, which is why it feels like a pocket rocket in inner city traffic. 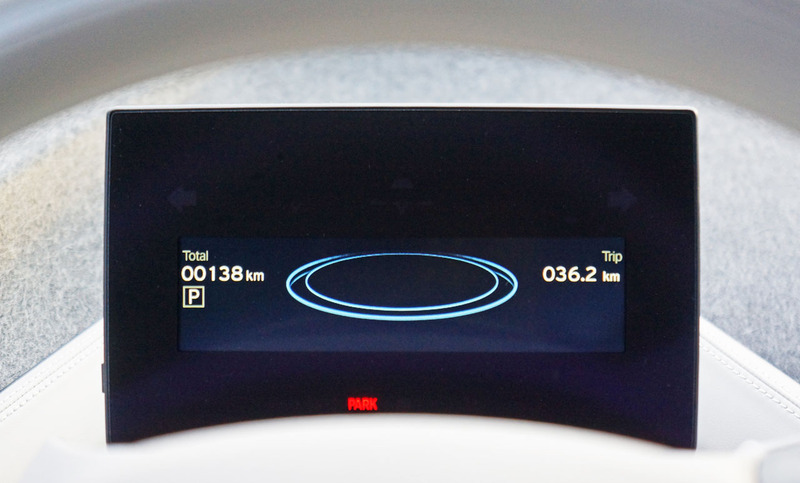 All the while its floor-mounted battery makes sure the centre of gravity stays low and cornering remains crisp. 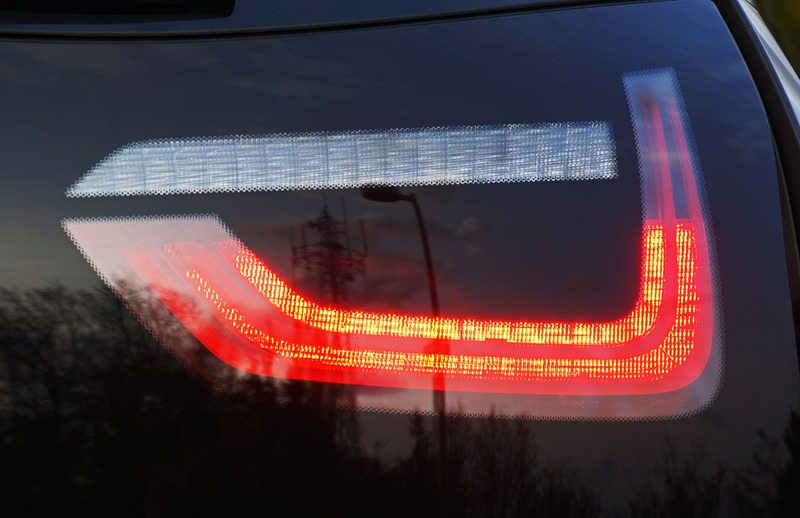 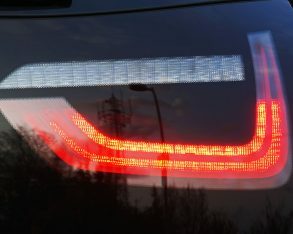 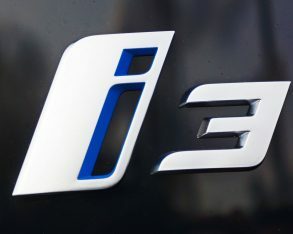 Strangely silent from a brand that normally allows its cars’ exhaust to enhance the auditory experience as much as outright performance, the i3 is nevertheless worthy of its blue and white propeller badge. 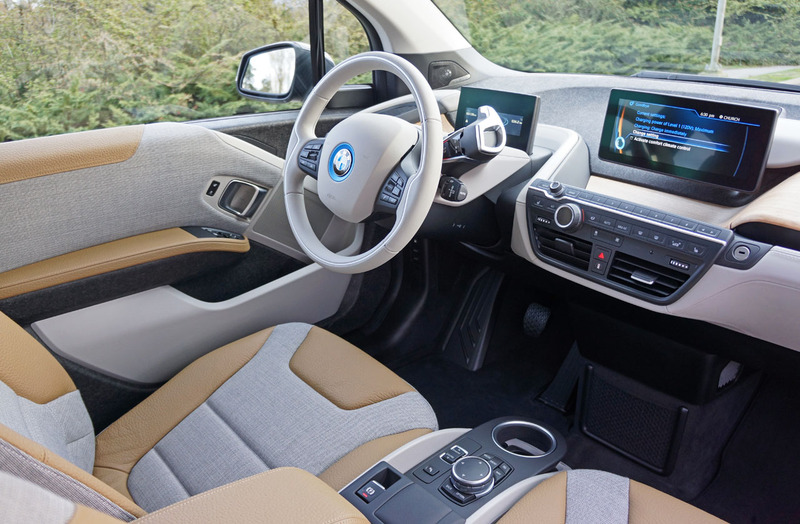 Along with that low centre of gravity, its 50:50 weight distribution and quick steering ratio make handling superb, while the i3’s turning radius is also excellent. 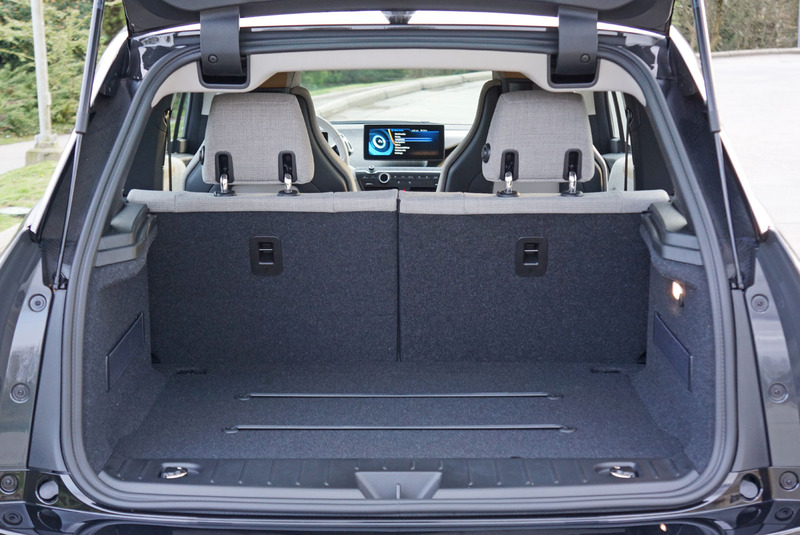 It slotted in and out of busy city congestion with the grace and composure of a lifelong urbanite, and then when allowed to stretch its little legs responded with the type of athleticism we’ve all grown to expect of the Teutonic brand. 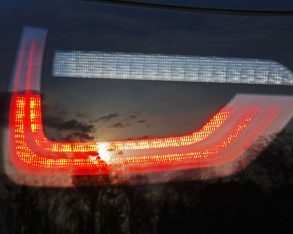 As much fun as I was having a niggling thought remained in the back of my mind, I’d better slow down as such pleasures can’t last forever. 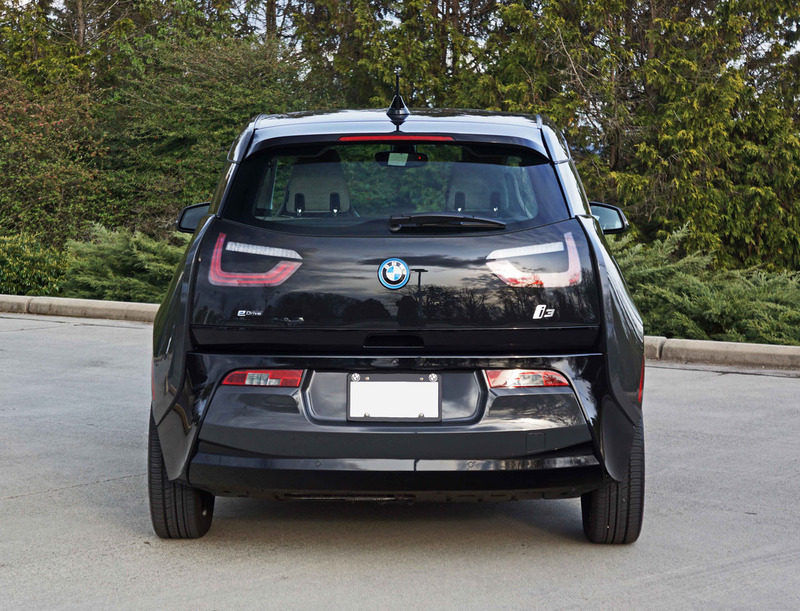 True, while extracting the most performance from one of BMW’s conventionally powered models might cost a bit more at the pump while reducing how far I could go between fill-ups, the i3’s range depletion is more dramatic with a heavy foot. 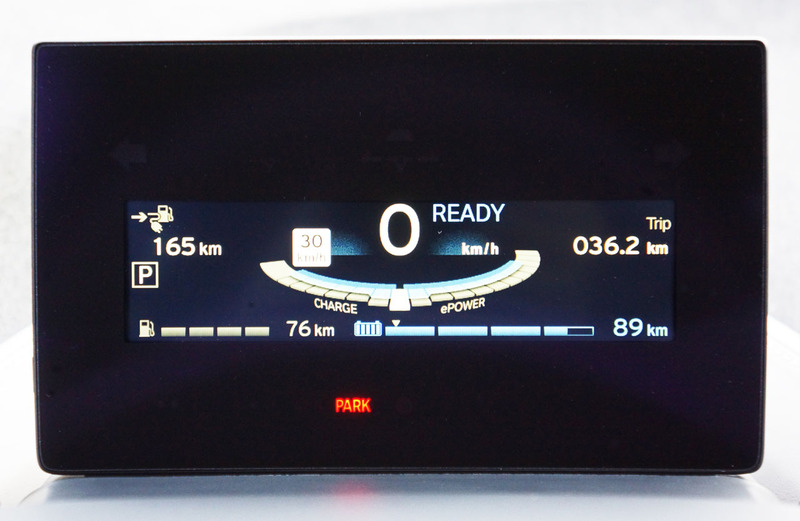 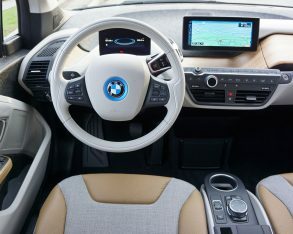 Its approximate 150-km range capability (130 km or 81 mph estimated by the EPA) from a single charge is very good and should last a couple of days for the majority of commuters if the i3 is driven in a more relaxed state, which I must admit allows greater enjoyment of the car’s many impressive amenities. 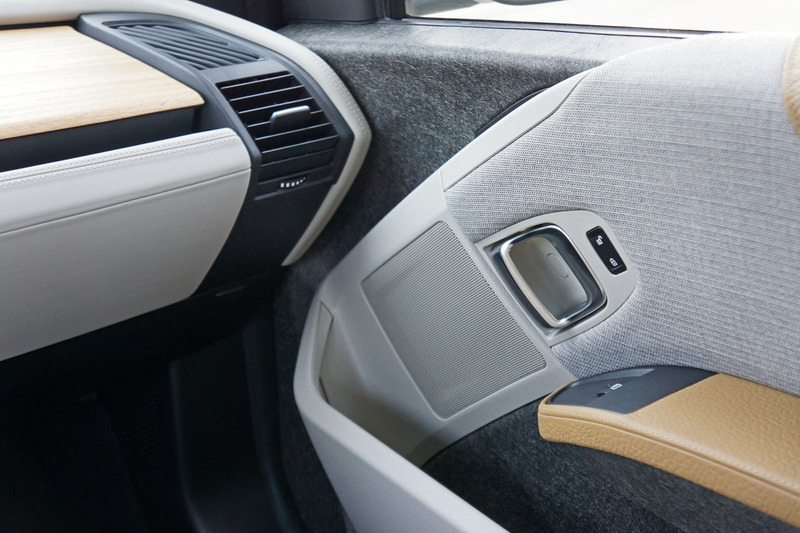 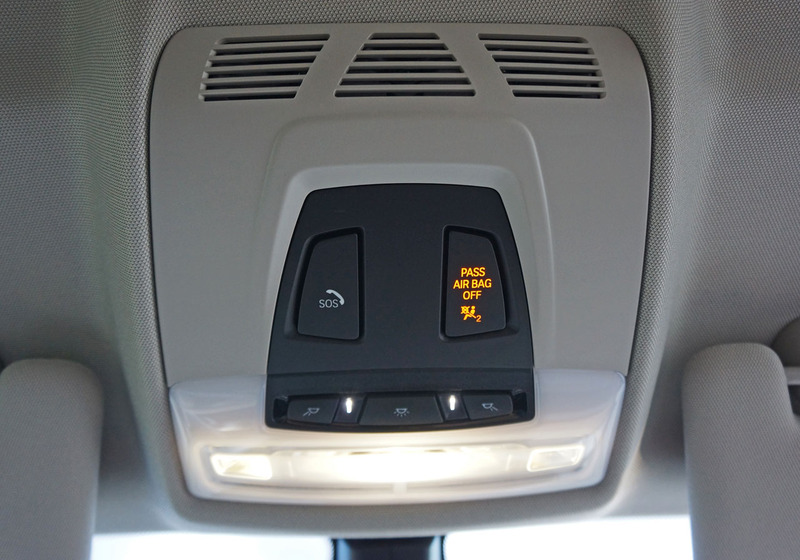 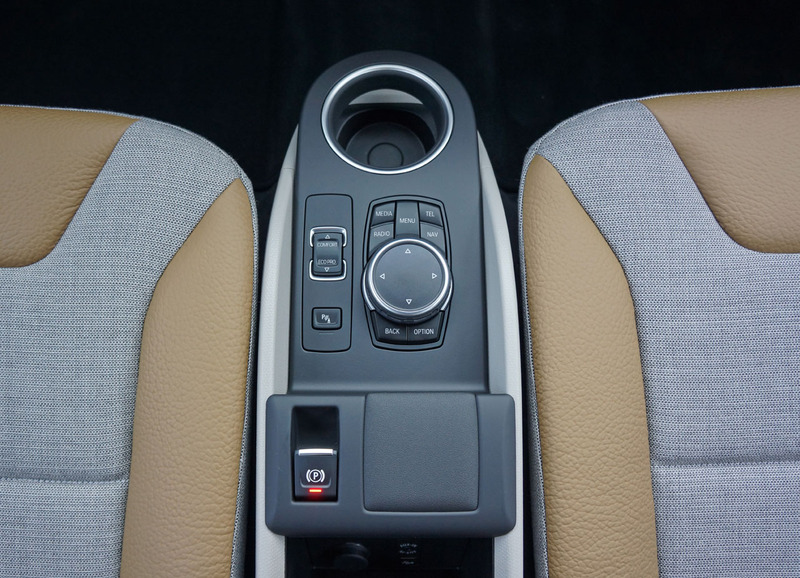 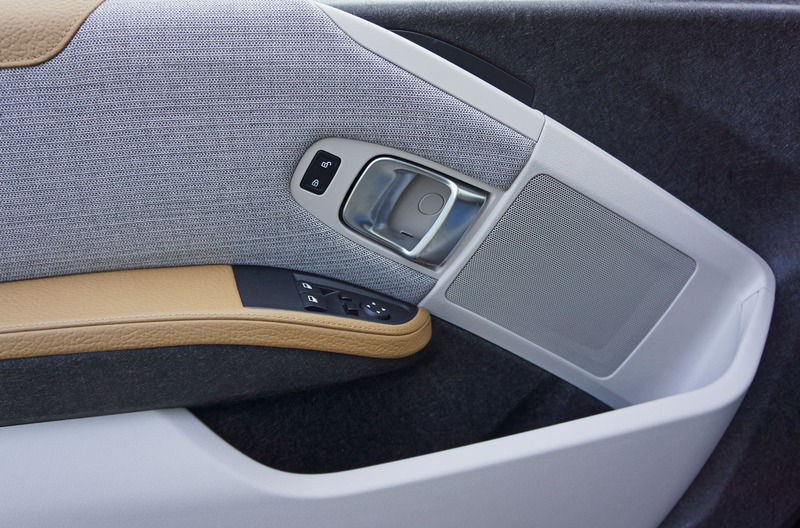 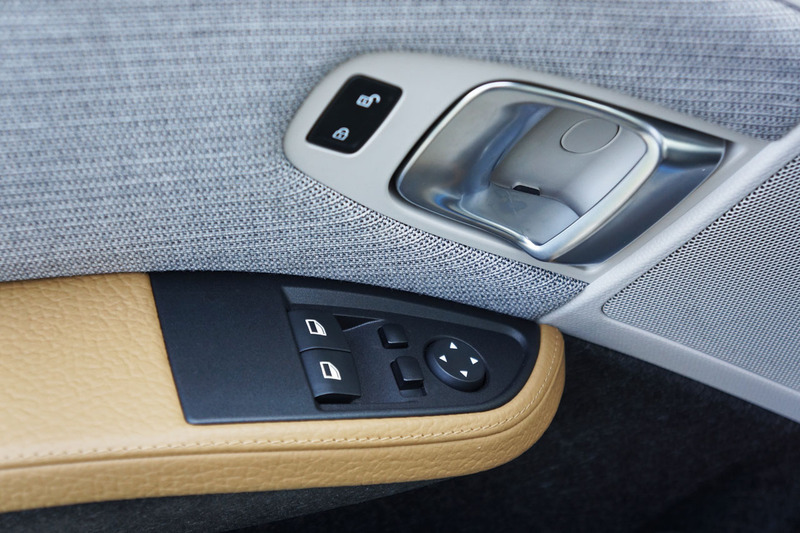 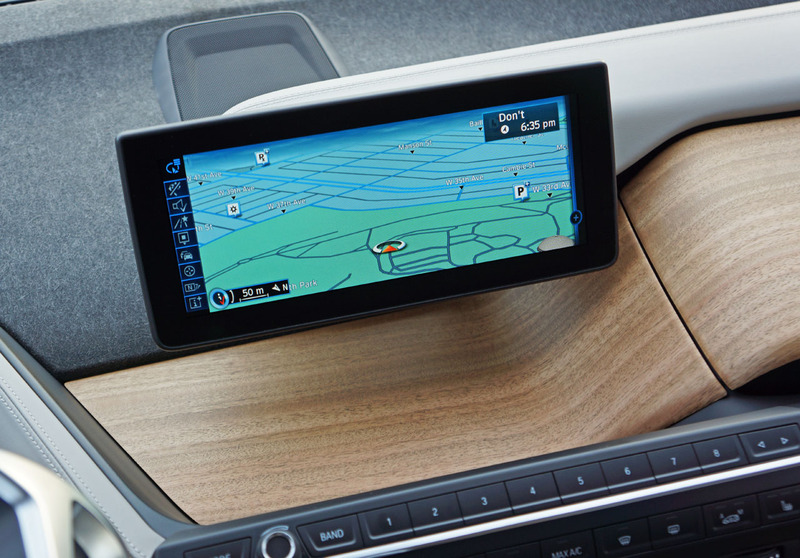 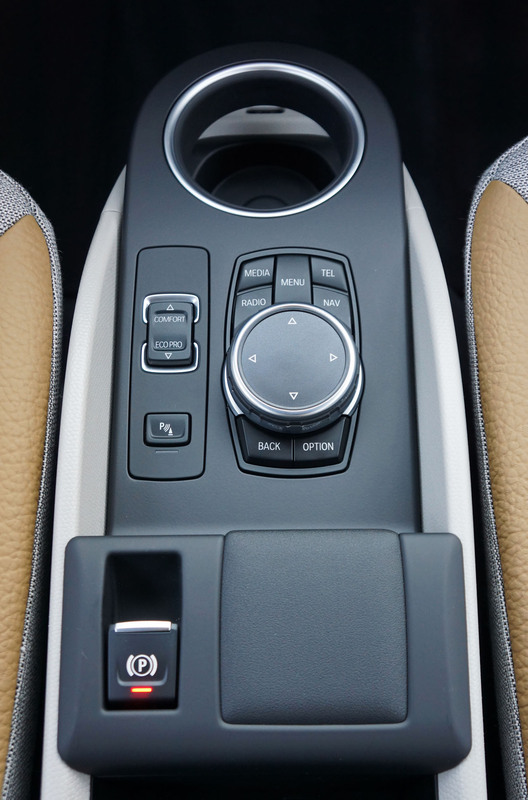 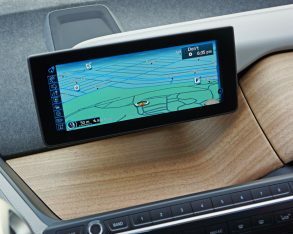 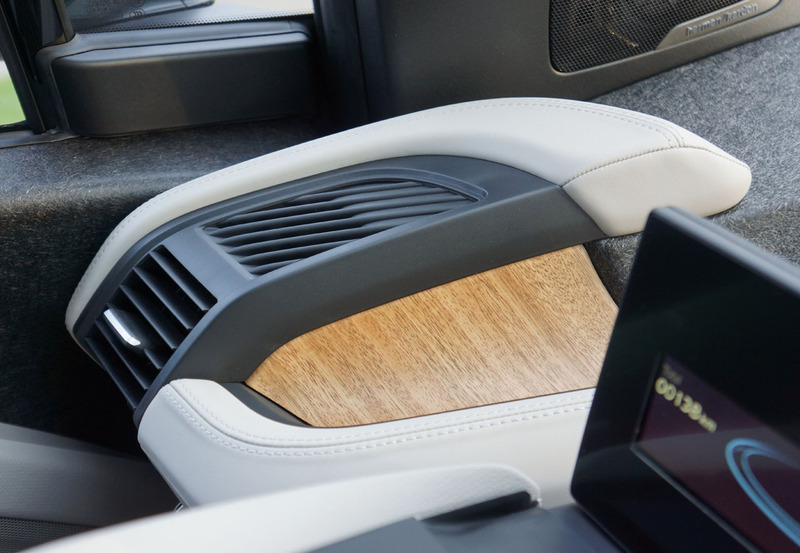 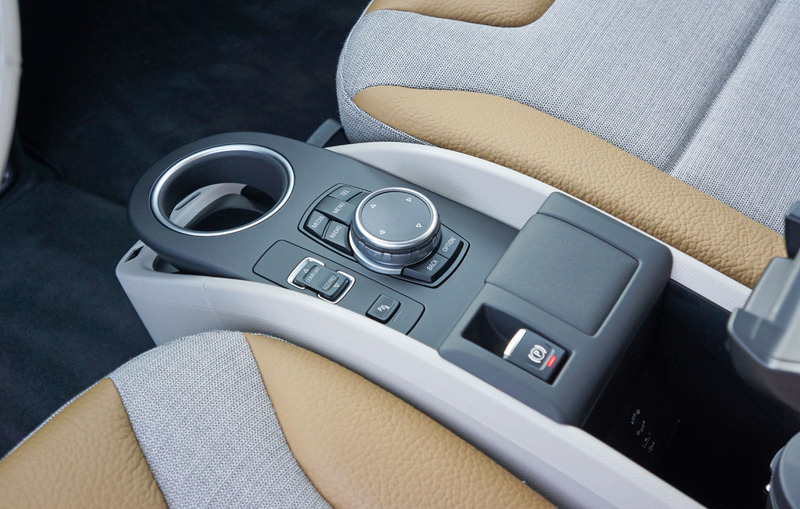 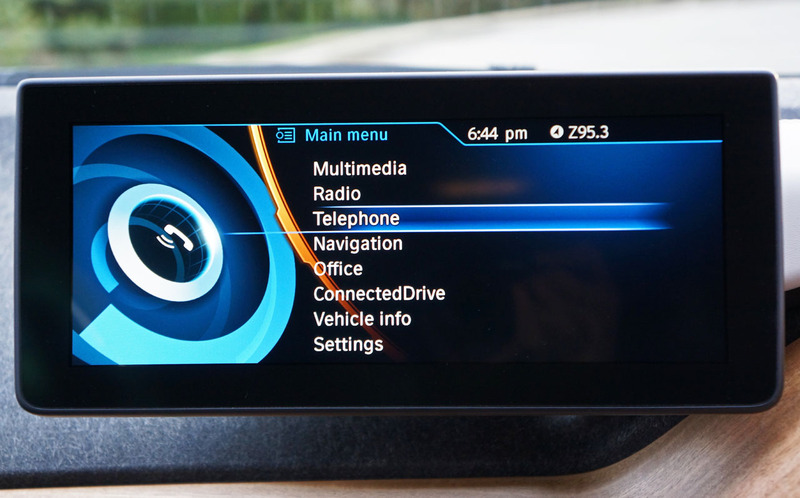 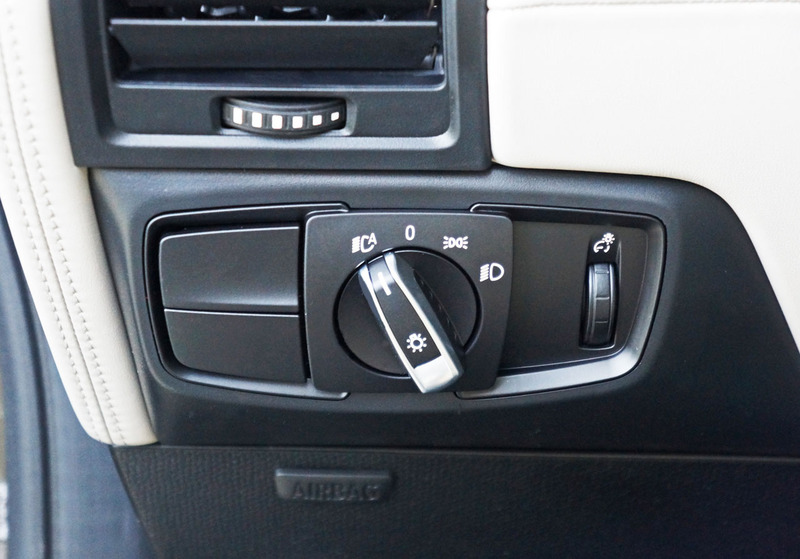 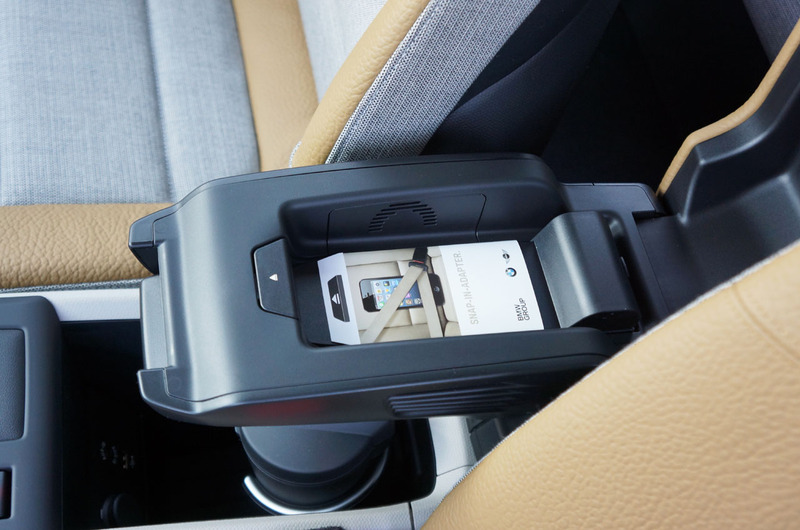 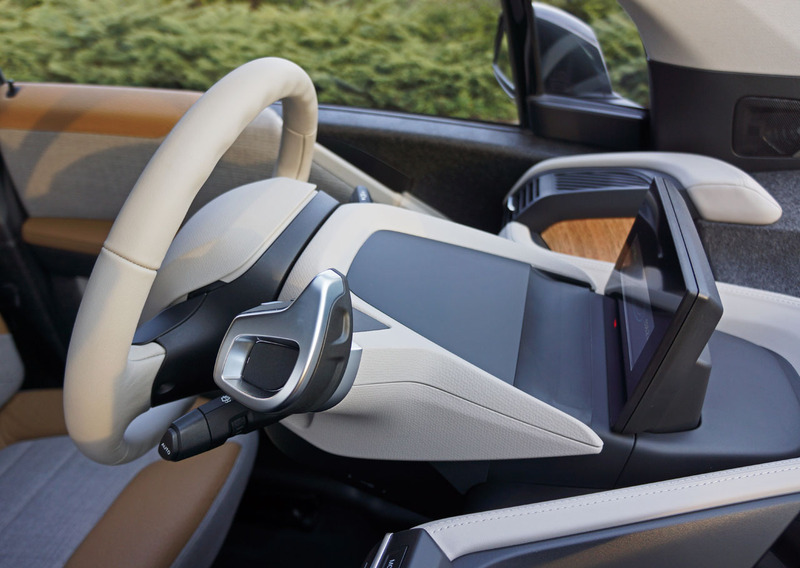 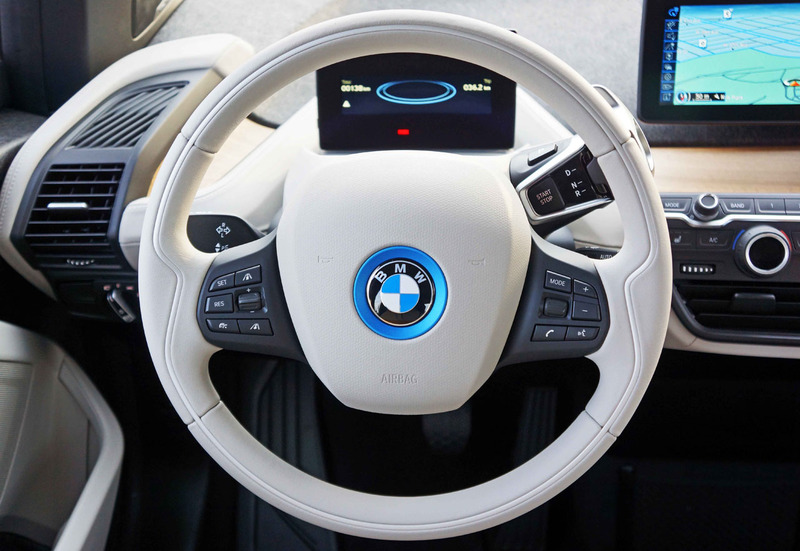 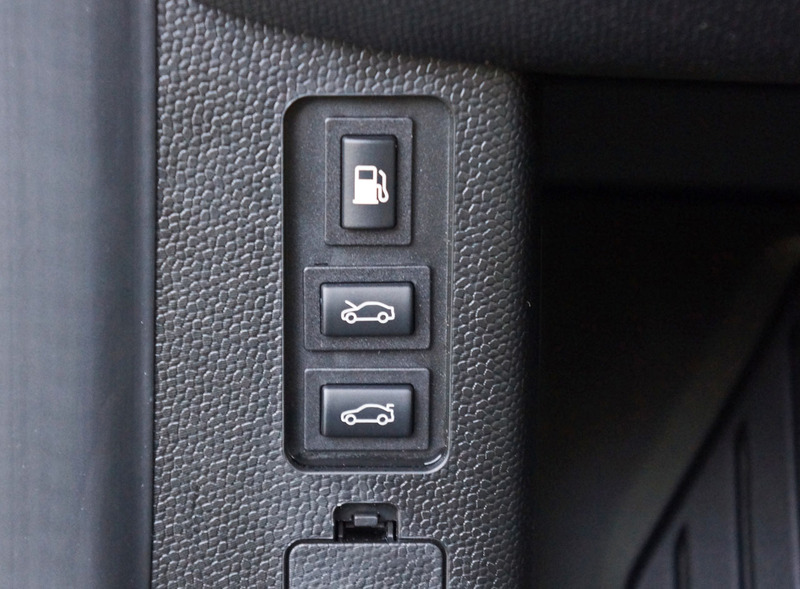 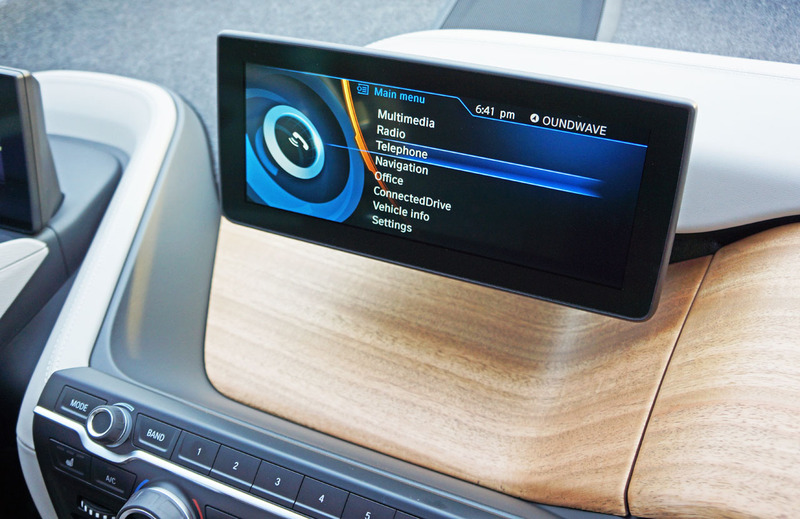 and automatic HVAC switchgear sits within a small interface at dash central, its quality up to BMW’s usual standards. 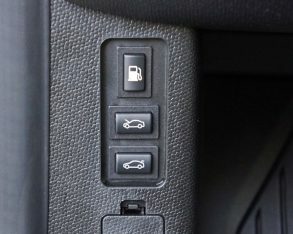 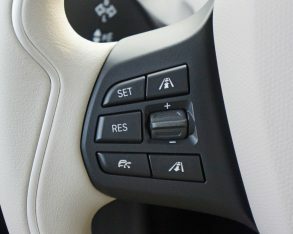 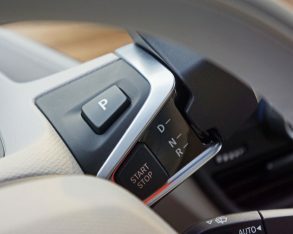 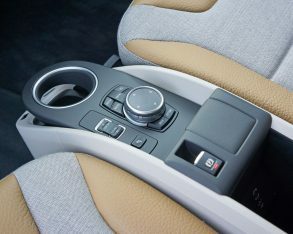 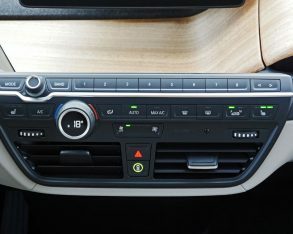 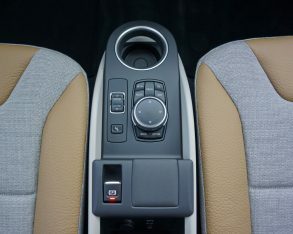 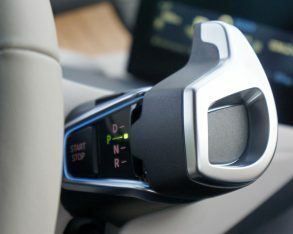 Dual controls for the latter is an obvious omission, BMW choosing instead to opt for efficiency rather than let driver-side coolness battle passenger-side warmth, wastefully usurping energy, but other than this and how efficiently it’s packaged there’s nothing unorthodox about the centre stack design. 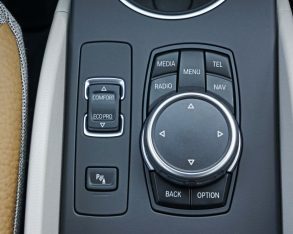 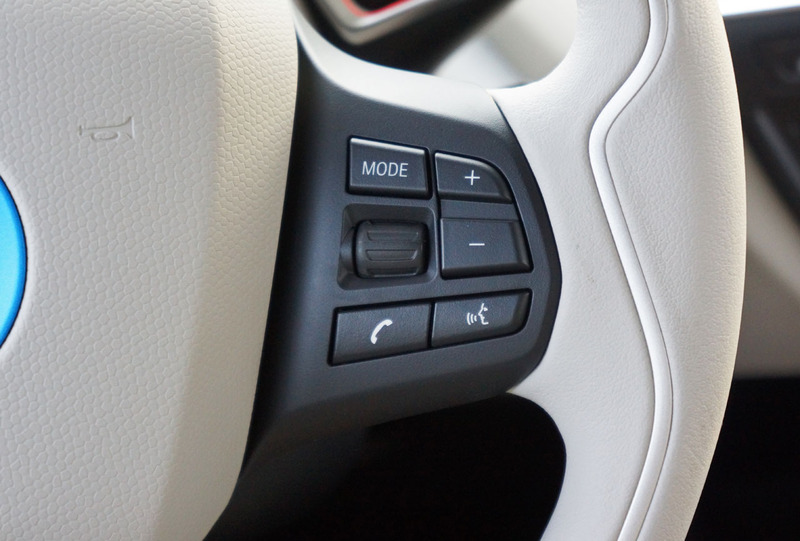 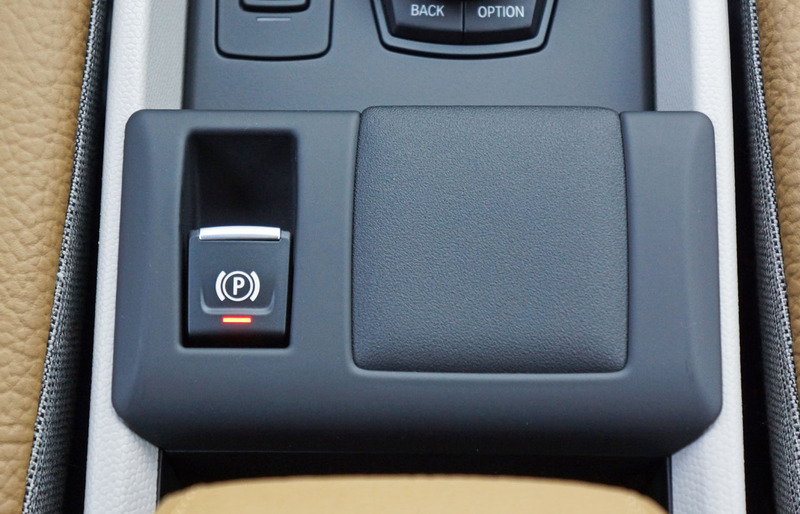 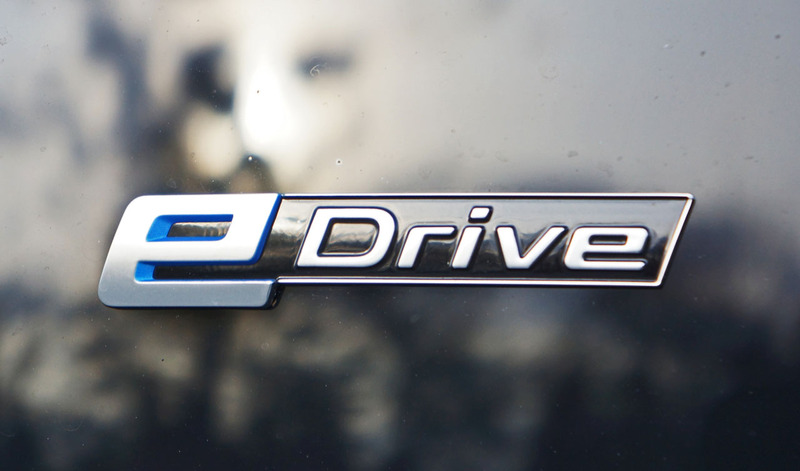 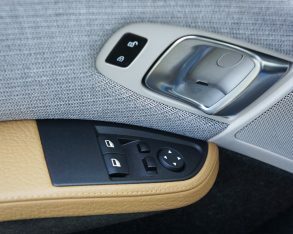 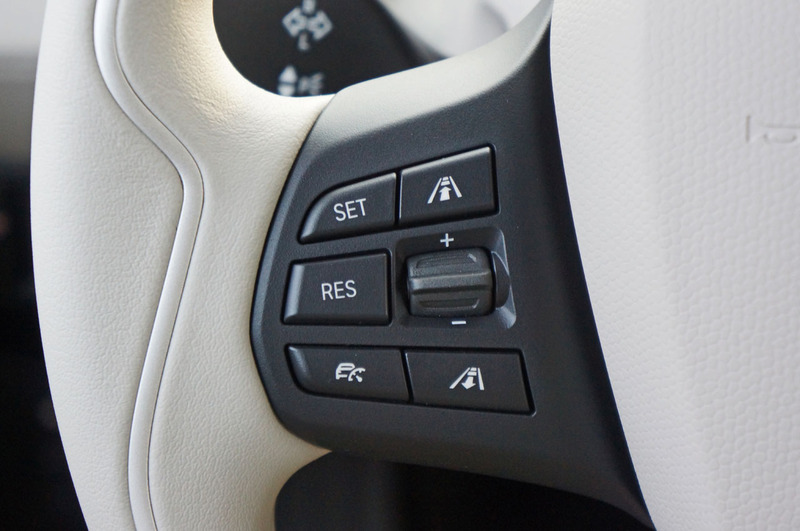 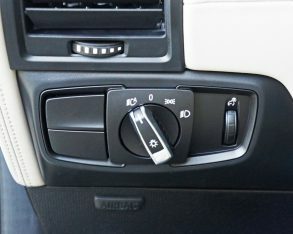 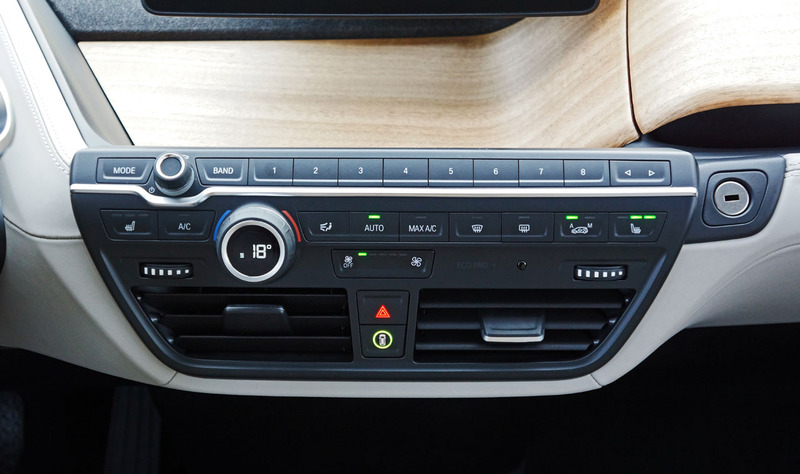 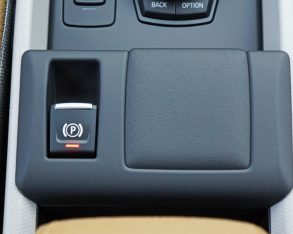 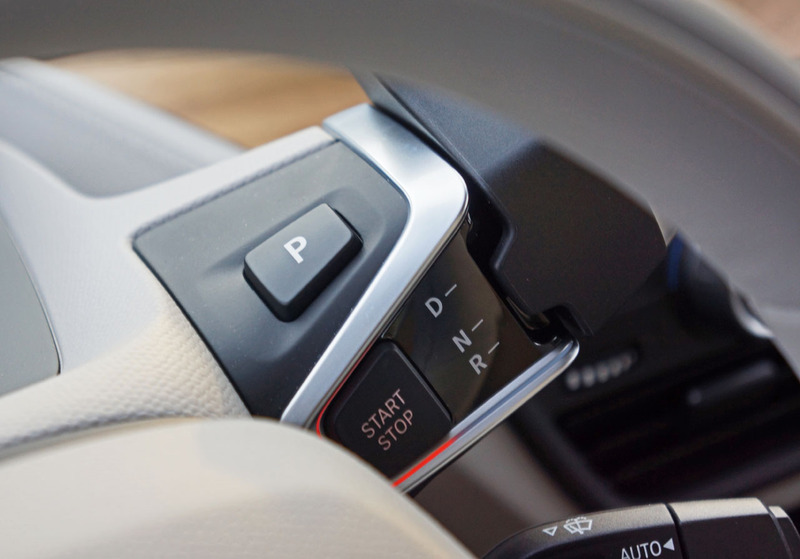 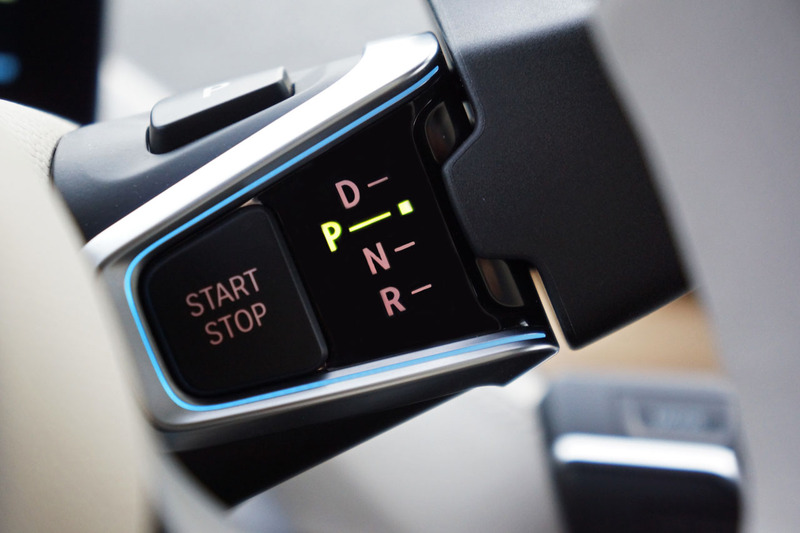 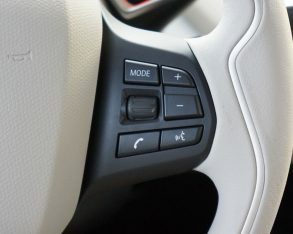 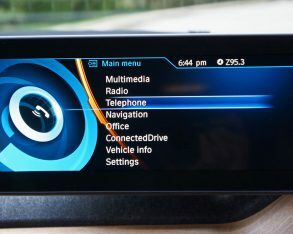 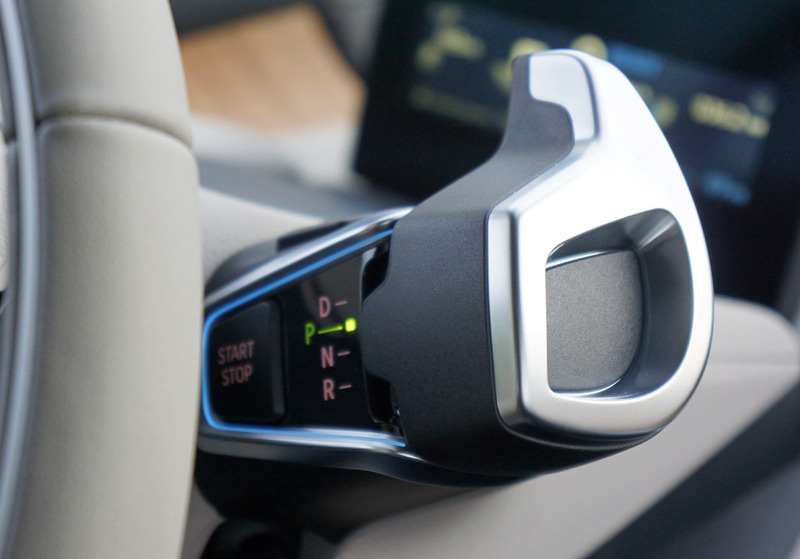 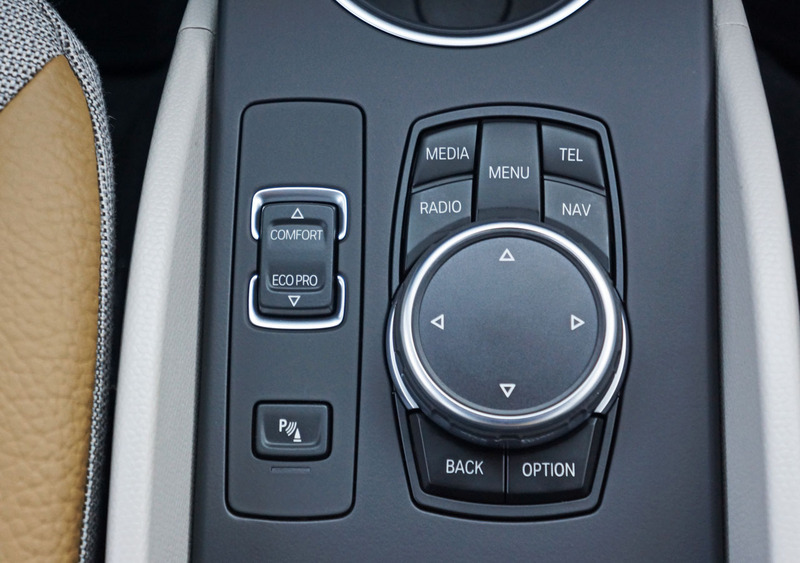 Likewise for BMWs iDrive controller that sits between the seats next to a toggle switch for Comfort or Eco Pro modes, plus the button for rear parking sonar. 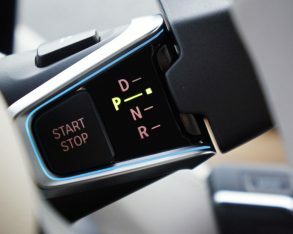 ignition button is placed just to the left of the backlit D, P, N, R display within a blue lighted surround and satin-finished aluminum casing, a separate button inscribed with P for park on top, plus an upside down and backward apostrophe-shaped controller to the right. 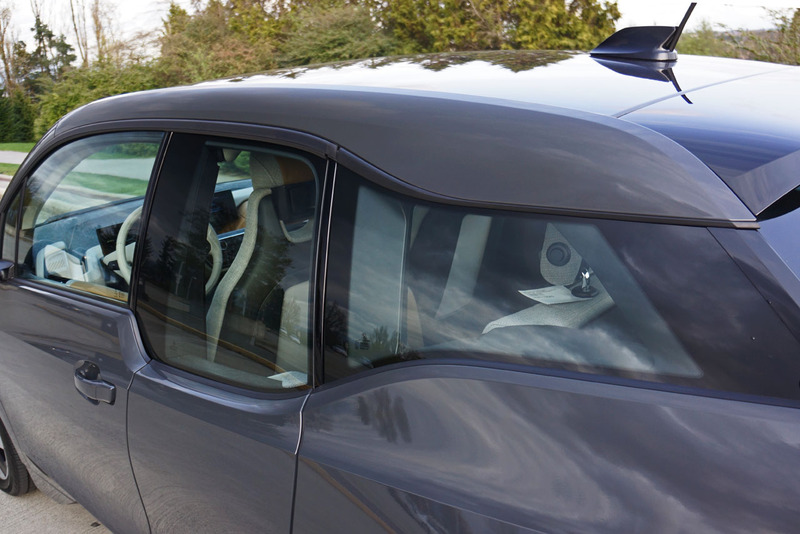 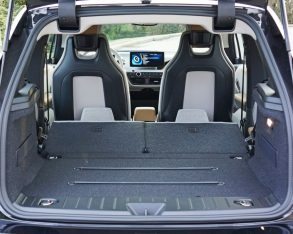 In all my years of covering the automotive sector I’ve never seen anything like it, but it worked perfectly and hardly encroached on the i3’s abbreviated cabin. 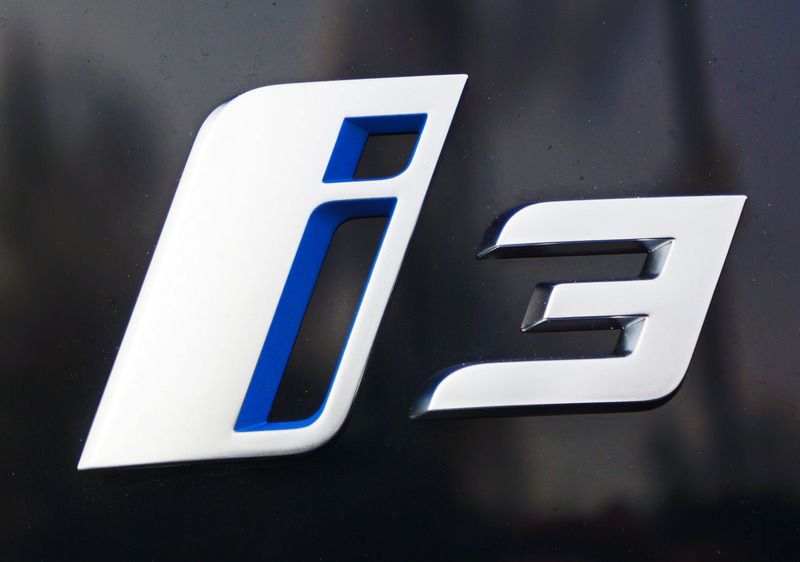 The word abbreviated isn’t really fair. 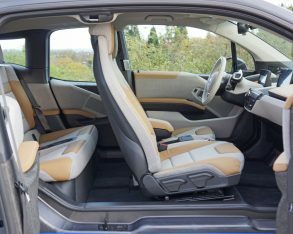 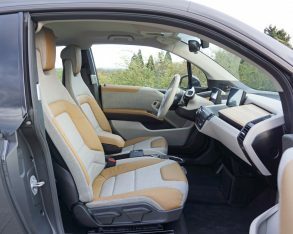 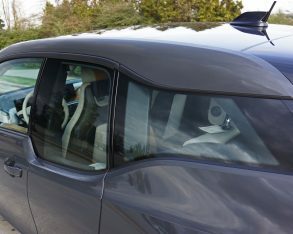 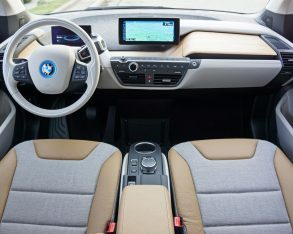 Sure the i3 is small, but as mentioned in the beginning of this review it’s as open and airy feeling as anything on four wheels. 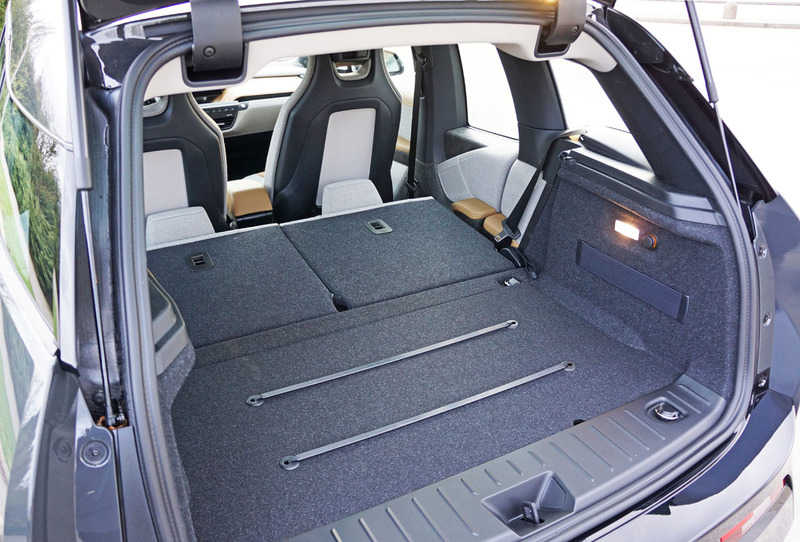 Part of this comes down to general height, its roof lofty enough that few should lack headroom, while the car allowed for ample shoulder and hip room. 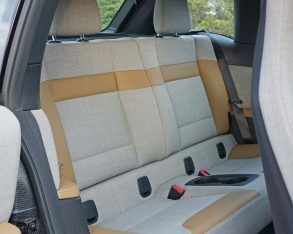 Legroom up front is another story, with so much available due to a complete void where the centre console would otherwise go you can play footsy with the front passenger, while the two rear seats were surprisingly spacious too. 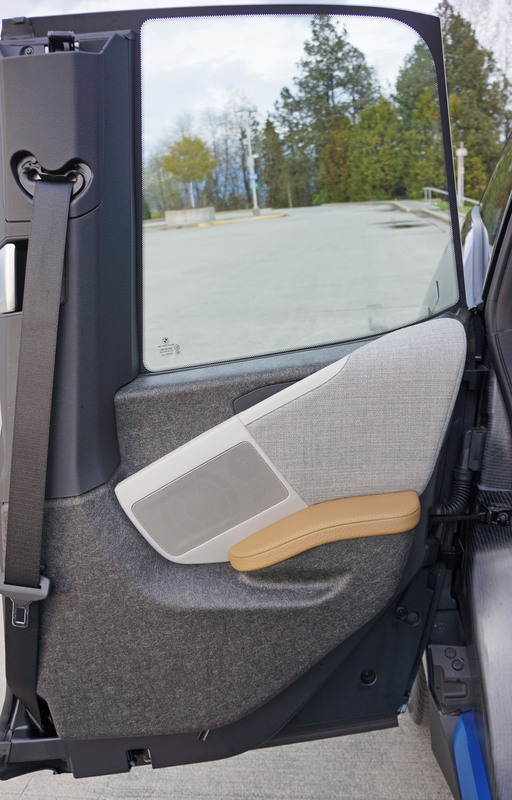 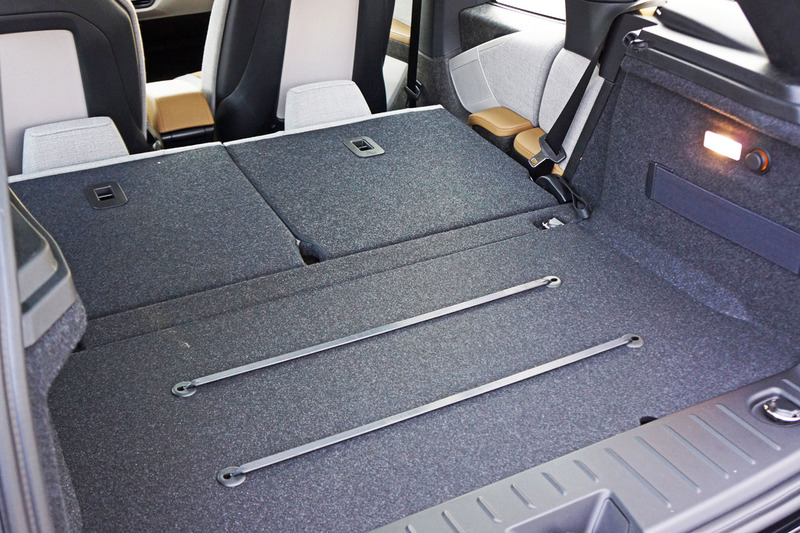 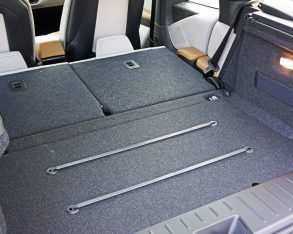 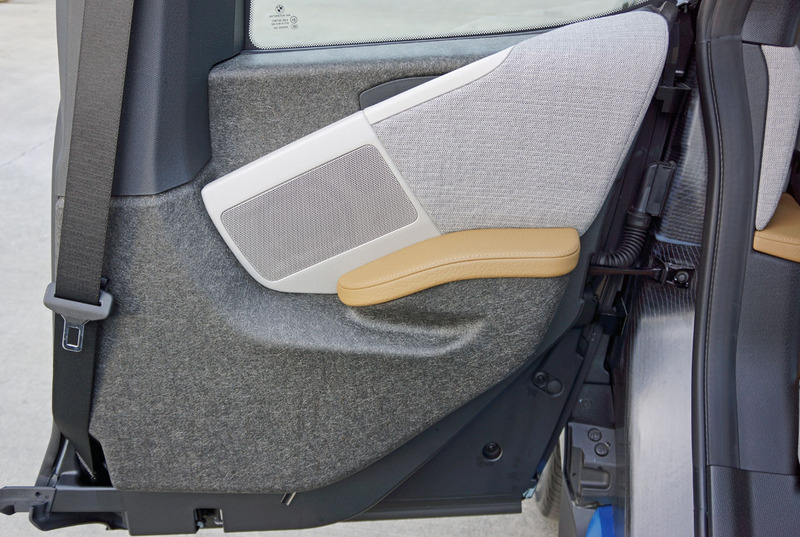 rear hatch opens up to a large 334-litre (11.8 cubic-foot) cargo area complete with rubber straps, tie-down hooks and thick mesh elastics on the sidewalls to hold groceries or what have you in place. 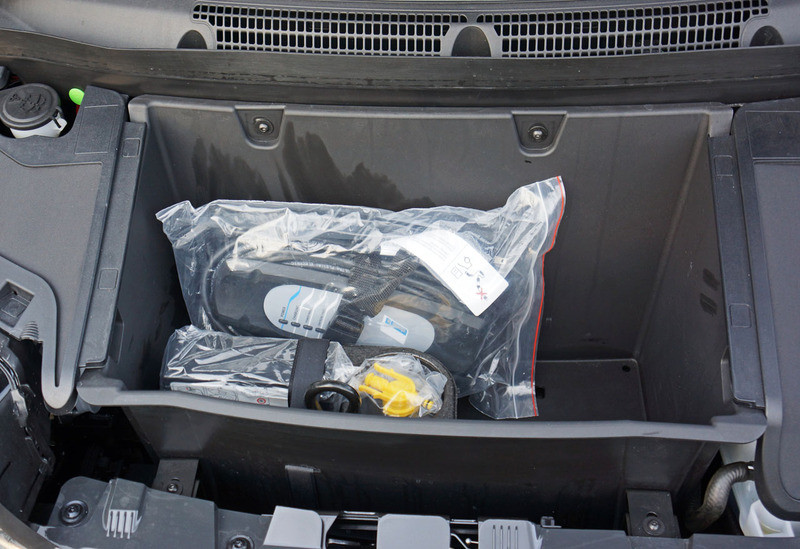 The seatbacks are split 50/50 for stowing longer items and they’re really easy to lower. 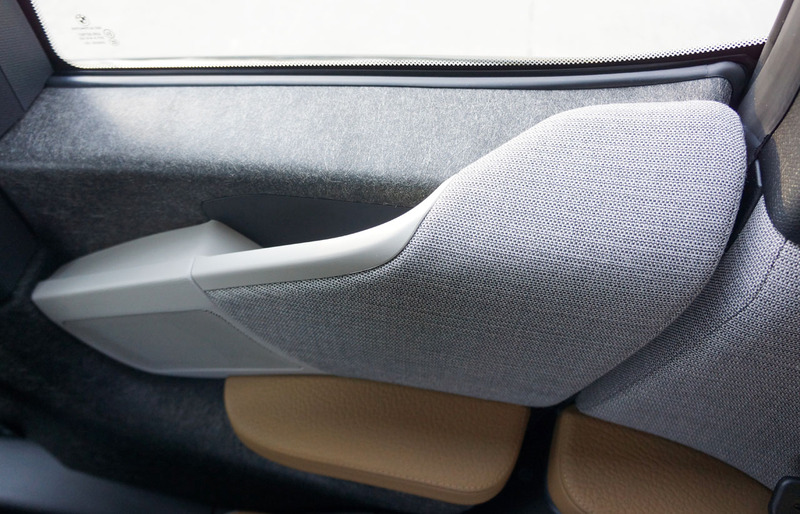 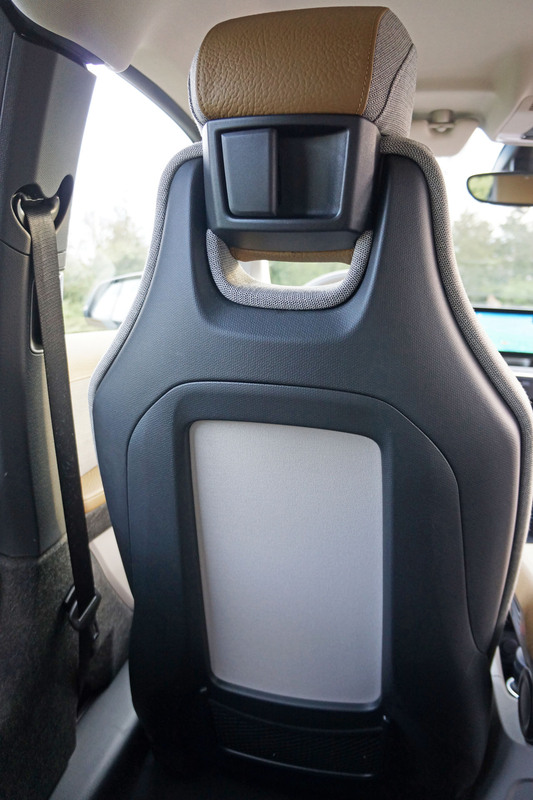 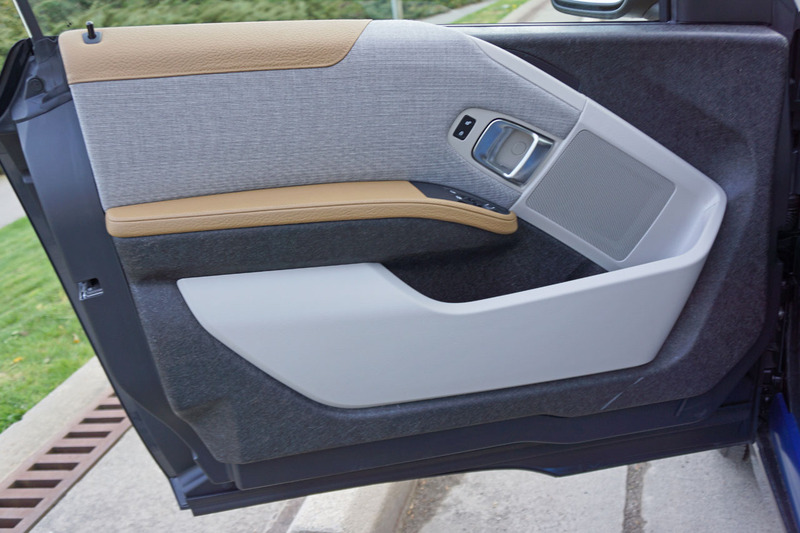 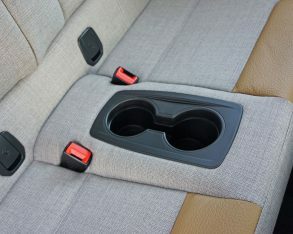 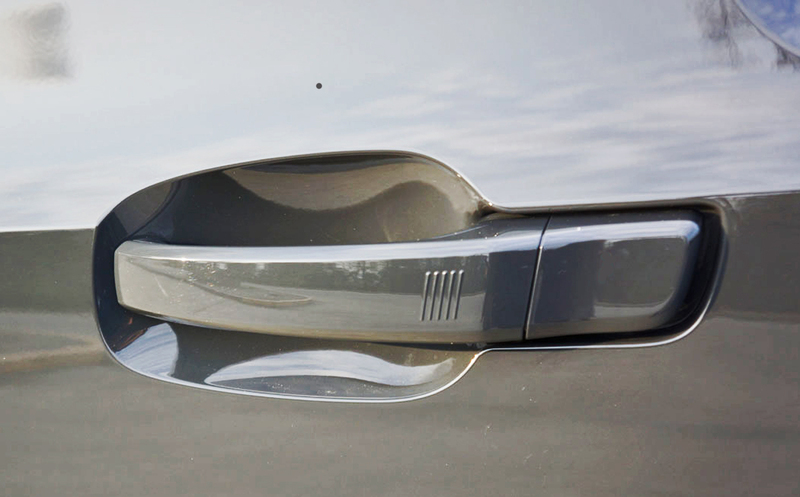 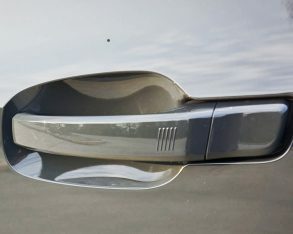 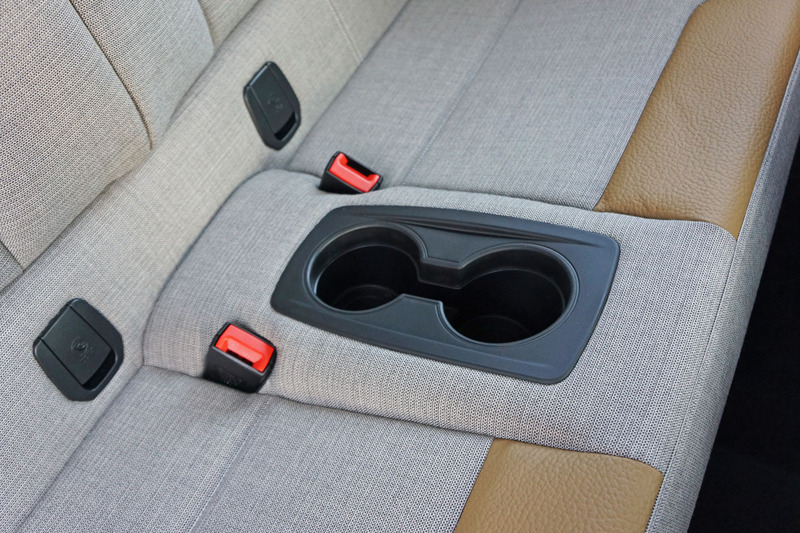 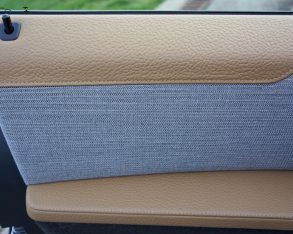 All you have to do is click a button on each side headrest, which flips it backwards, and then tug on a little mesh pull before they fall completely flat, a process that’s easily executed from the rear and results in a commodious 1,045 litres (36.9 cubic feet) of maximum capacity. 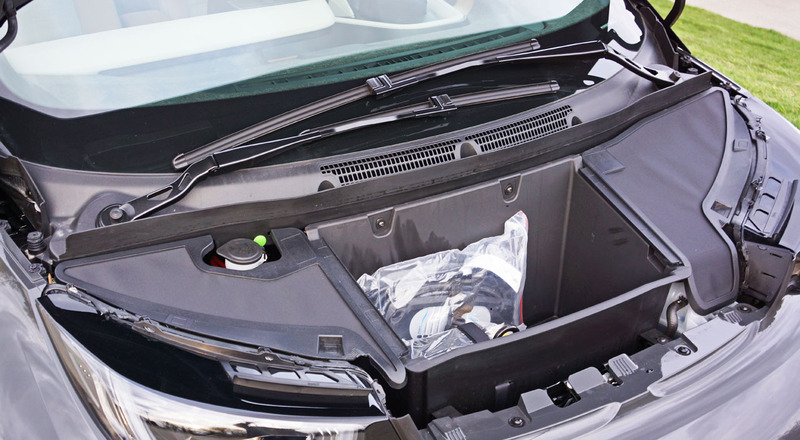 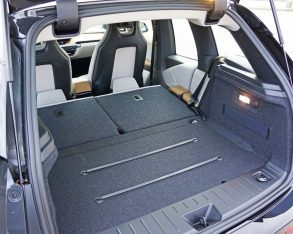 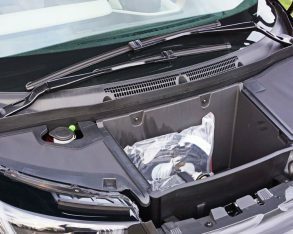 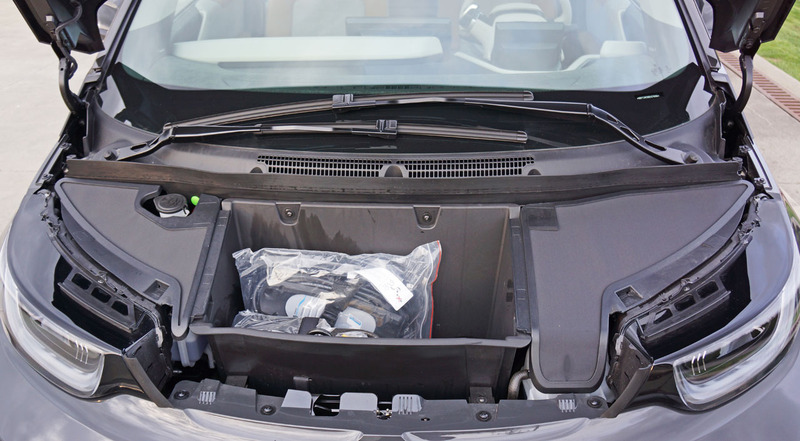 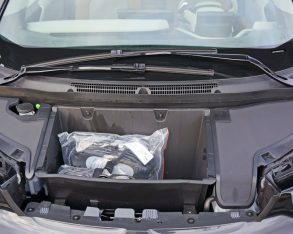 Additional cargo can be hidden within a little bin under the front hood where BMW otherwise stows the car’s EV plug and cord. 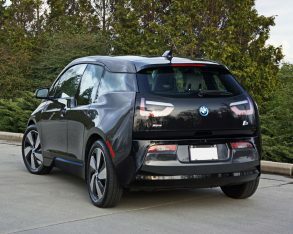 charging system, and free EV parking is most often part of the deal, whereas a home socket will completely replenish the i3’s 18.8-kW/h lithium-ion battery overnight, an item that BMW warranties for eight years, incidentally, and claims will last an average of 15. 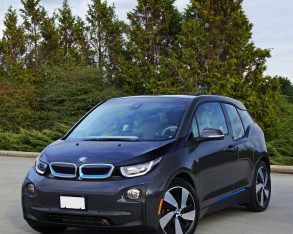 A 240-volt Level 2 AC BMW i Charging Station will cost you less than you think, so quick charges from home or the office are possible. 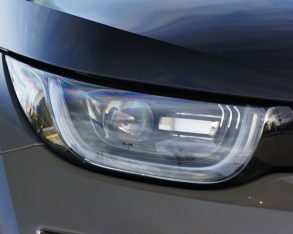 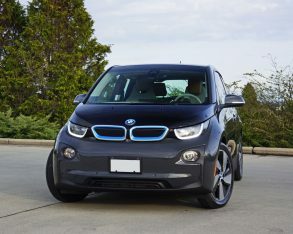 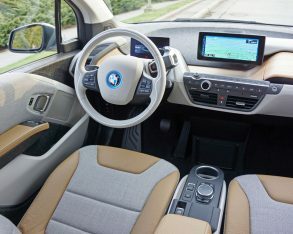 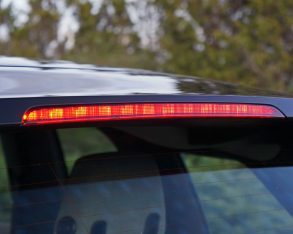 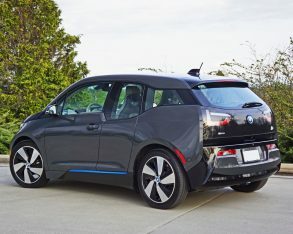 If you tend to drive further, such as up to Whistler, Mont-Tremblant or Muskoka on weekends, there are charging stations along the way, or alternatively you can opt for the i3’s $4,000 two-cylinder range extender engine, a gasoline-powered generator that virtually doubles overall range up to 250 km, while using very little fuel. 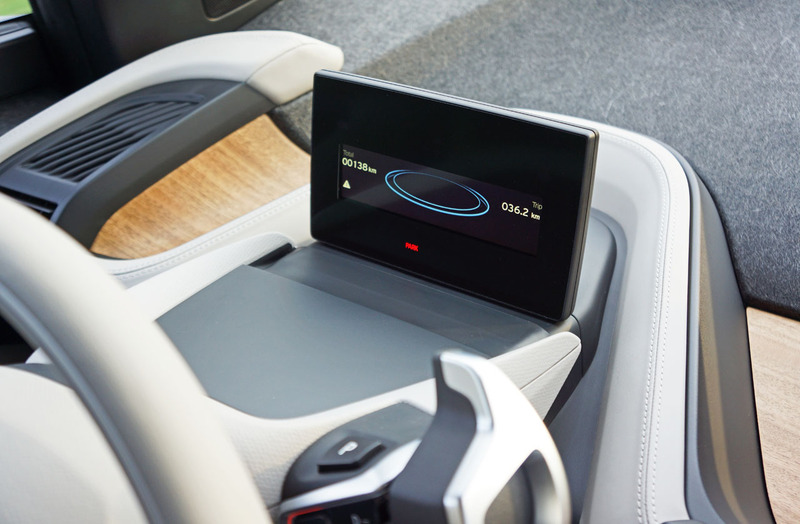 the car’s various functions from audio and HVAC to phone and overall system settings, but also includes a range perimeter system to help you plan your charging points, not to mention warn you before passing the halfway point of your trip. 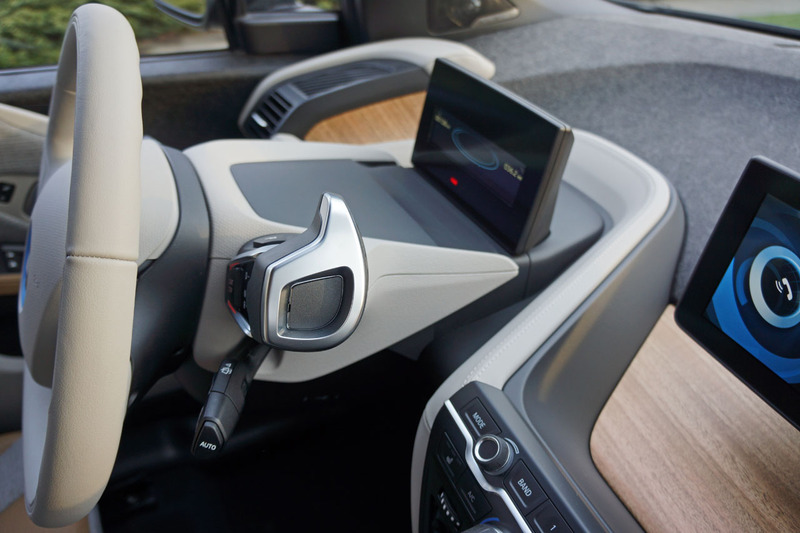 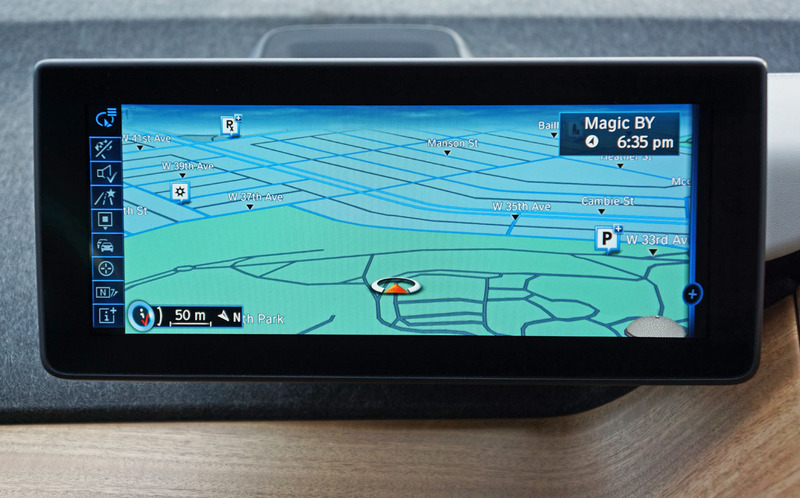 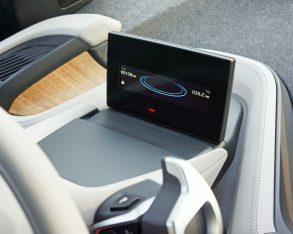 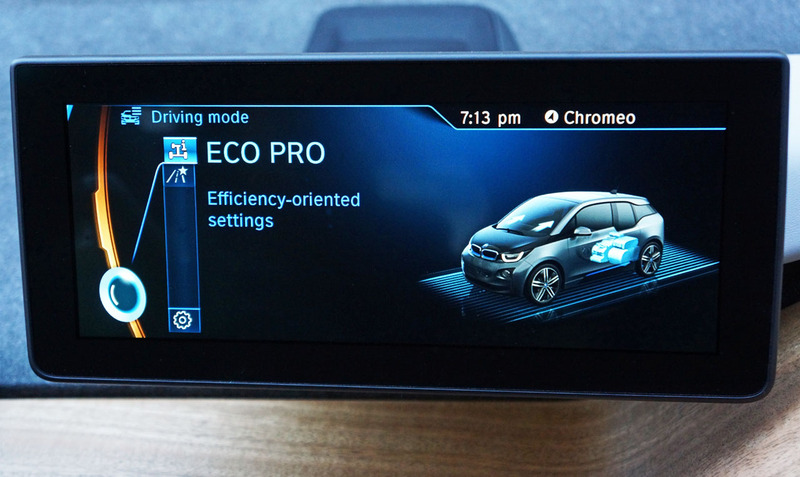 It’ll visually guide you to the closest charging station too, plus various other functions to make sure your i3 experience is as fret free as possible. 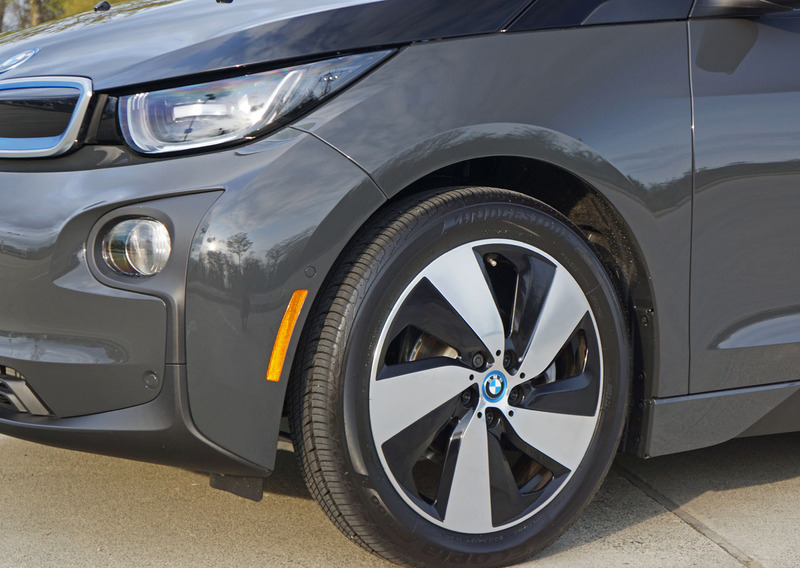 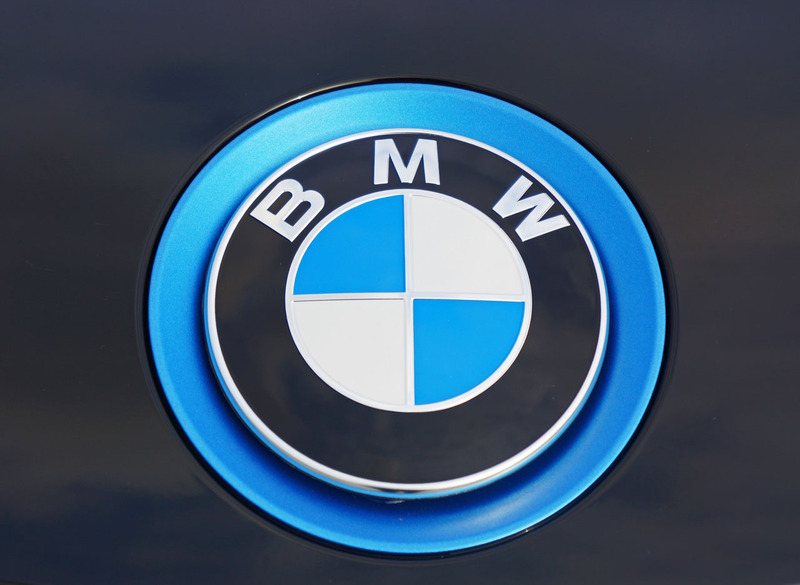 If worse comes to worst and you find yourself street-side and out of power, BMW roadside assistance will respond with a recharge at no charge to your wallet. 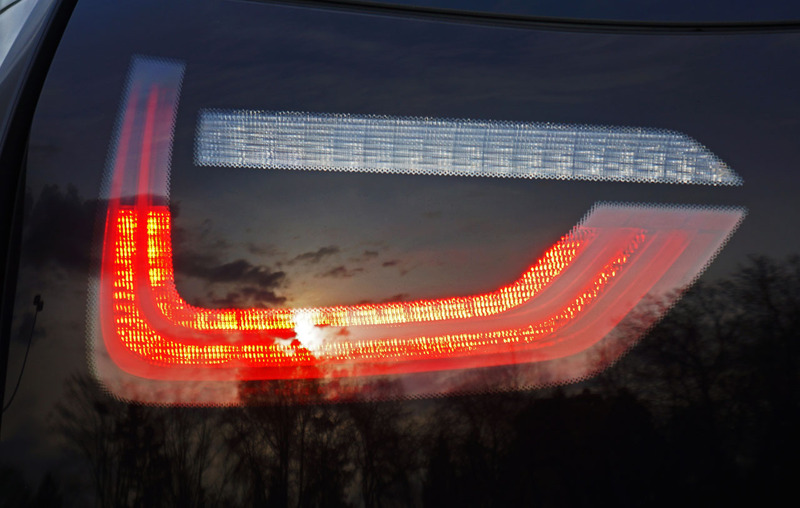 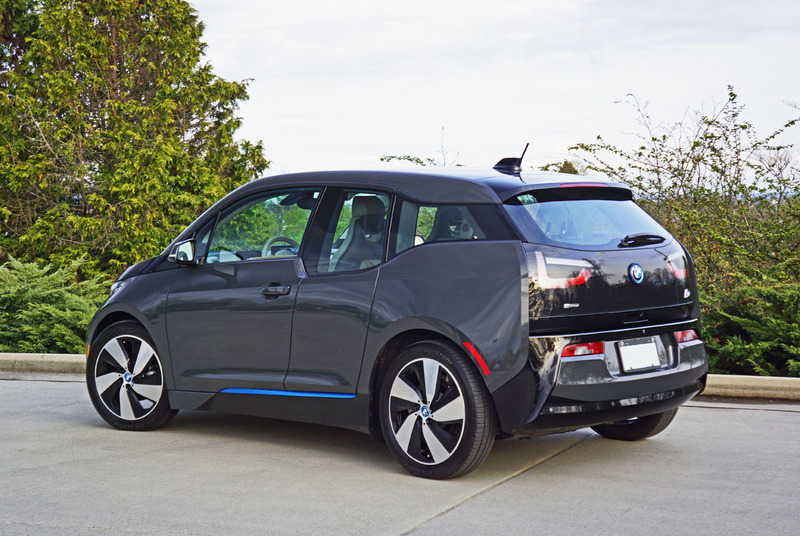 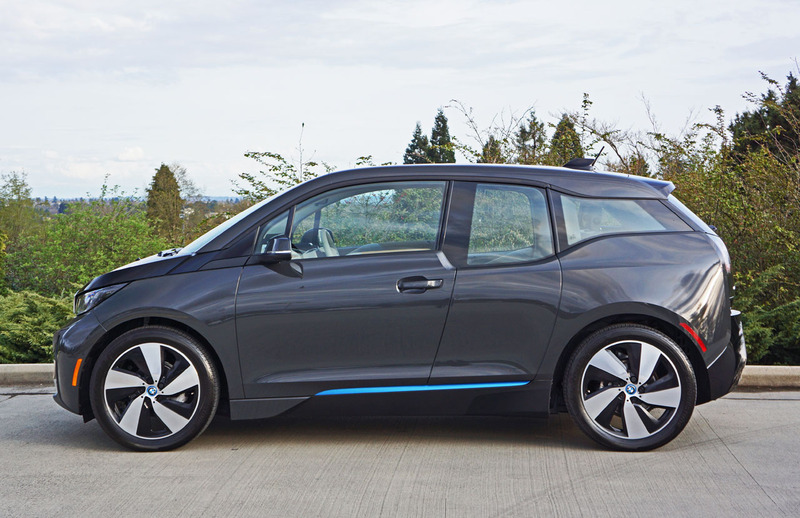 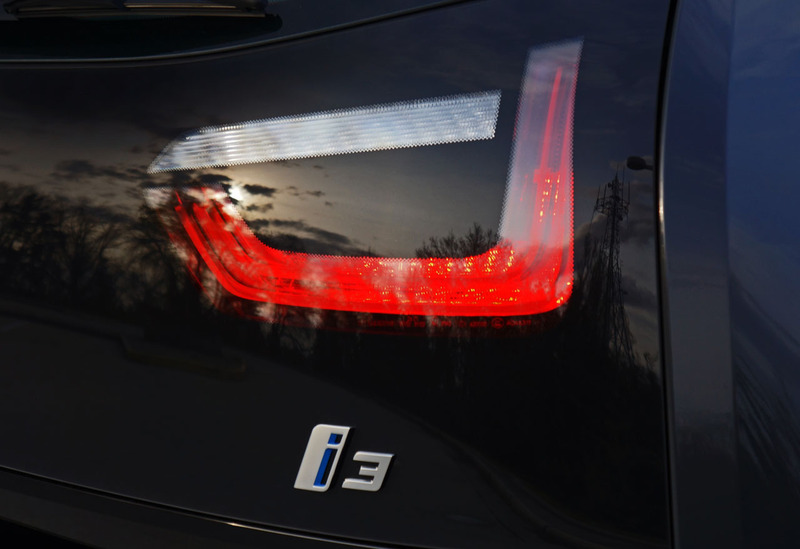 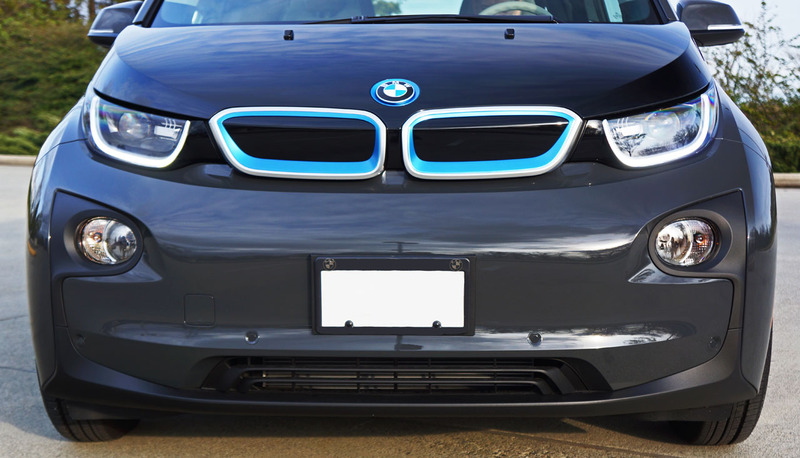 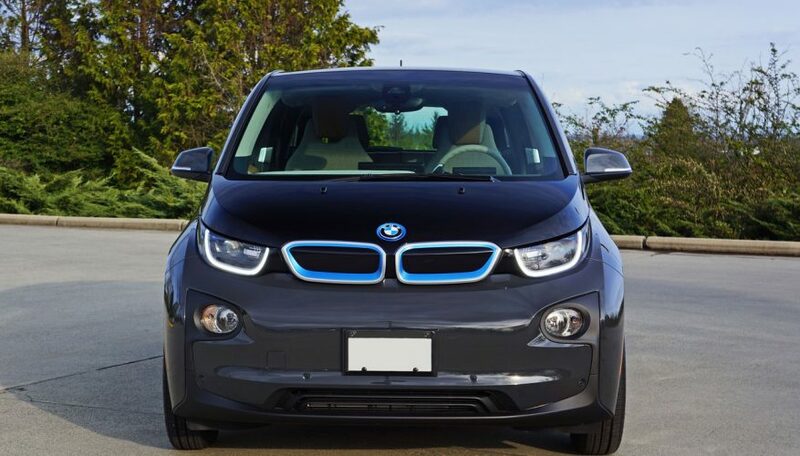 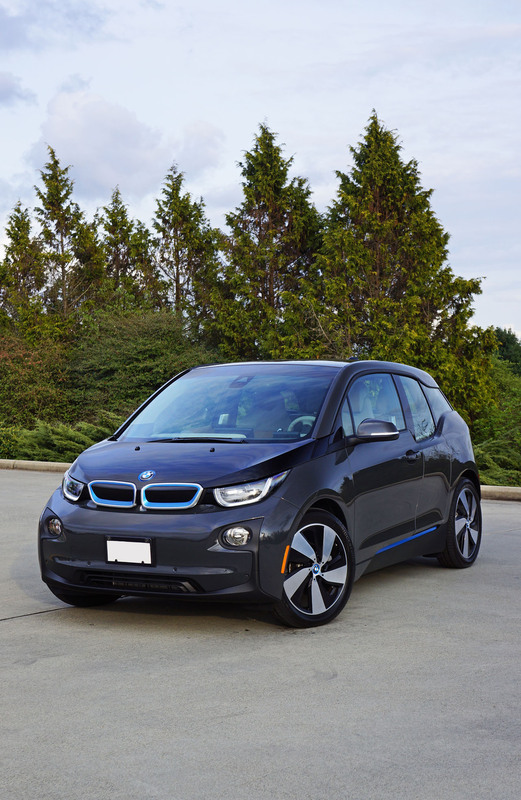 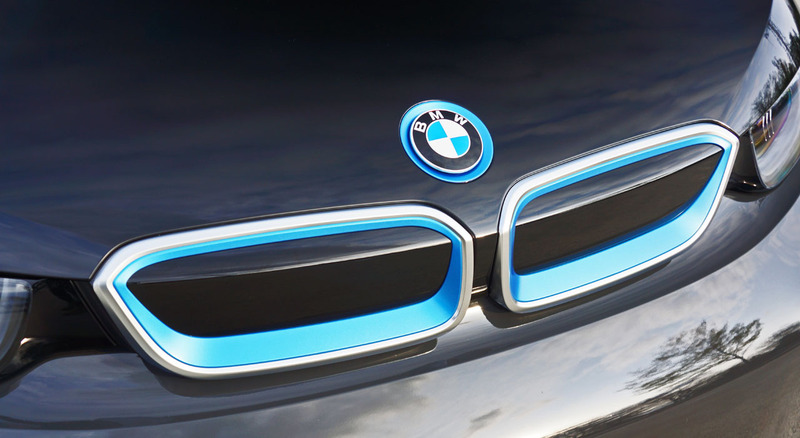 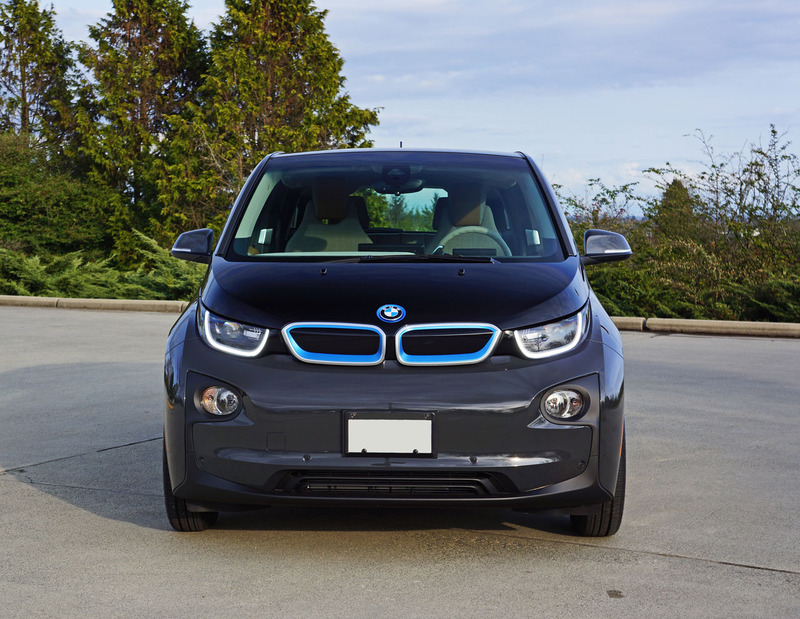 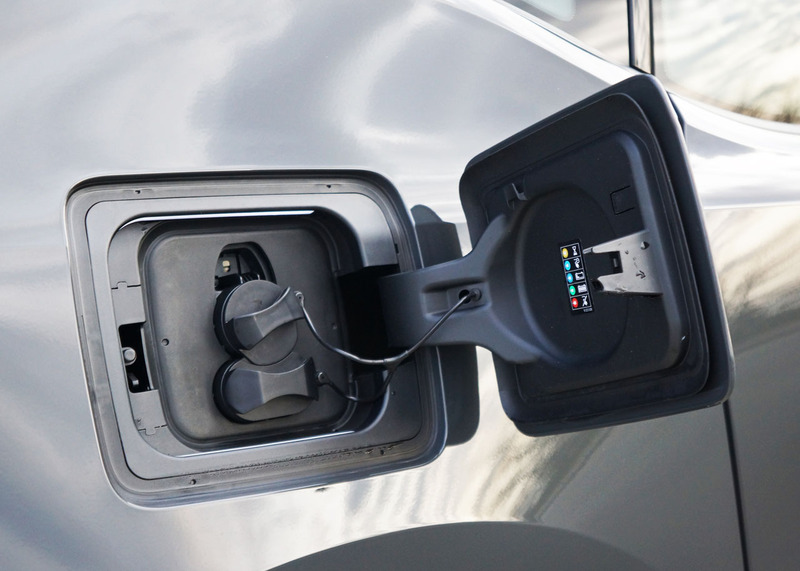 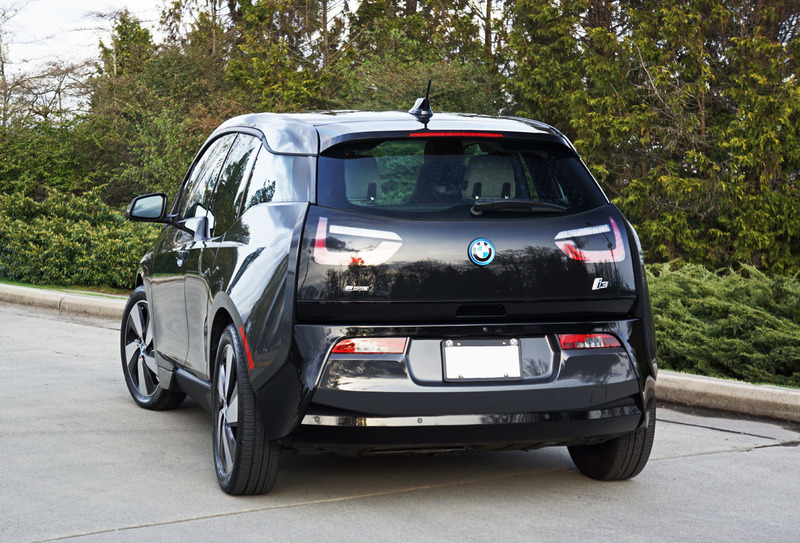 while the i3 with the range extender is the most efficient EPA-certified current year vehicle with a gasoline engine. 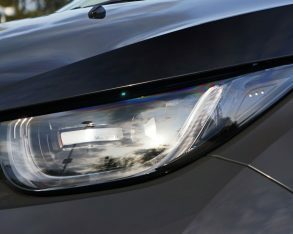 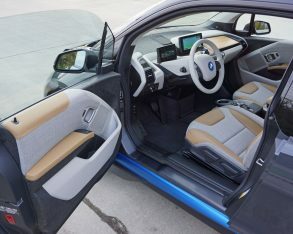 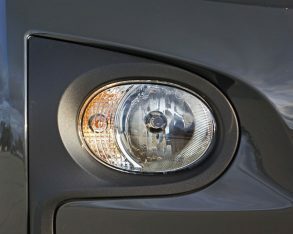 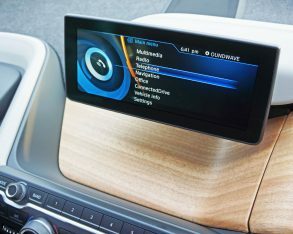 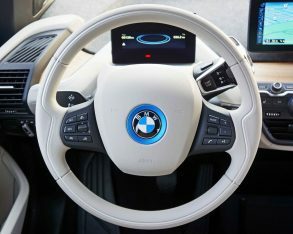 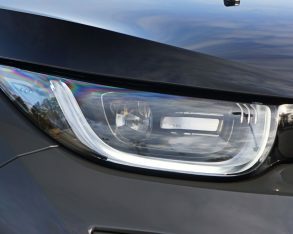 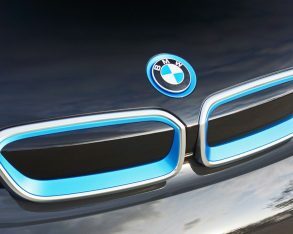 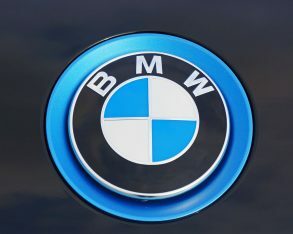 going electric, and then factoring in the i3’s exotic supercar-like construction, amazingly eco-friendly materials and build processes, concept car design, brilliantly executed interior and impressive performance easily makes it worth BMW’s asking price of $44,950 plus $2,095 for freight and pre-delivery prep. 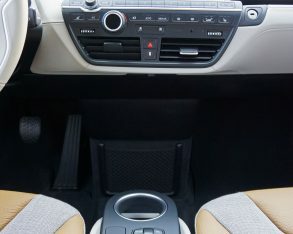 For that money the base Loft trim level includes the aforementioned 19-inch alloys and automatic climate control, plus automatic LED headlights, rain-sensing wipers, a multifunction steering wheel, 100-percent recycled polyester fabric upholstery, auxiliary cabin heating (an innovative heat pumping system that uses the energy of ambient air to warm the interior with 50-percent greater efficiency), heated front seats, BMW’s Navigation Services Business, BMW Assist emergency calling, BMW’s Remote Services bundle, the AC fast charging system and more. 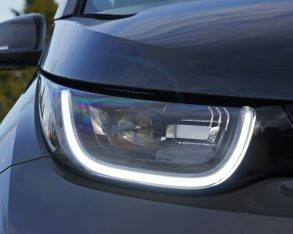 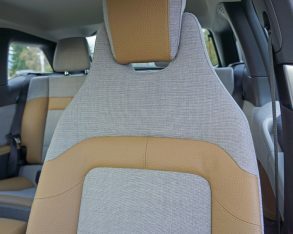 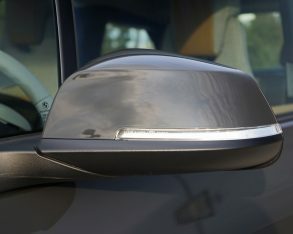 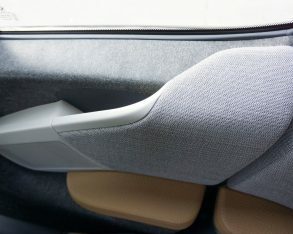 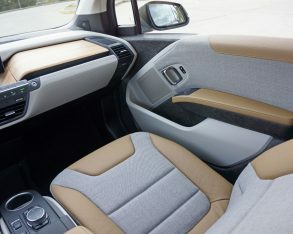 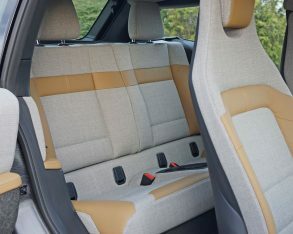 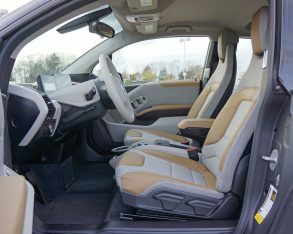 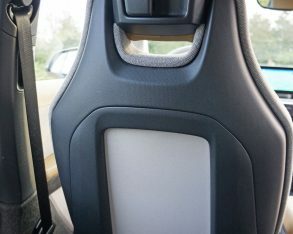 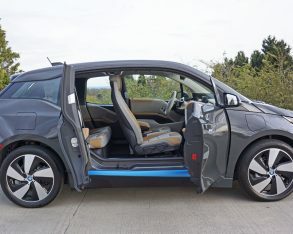 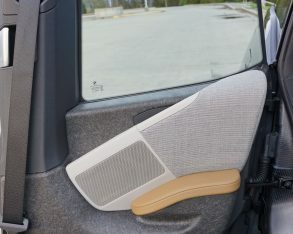 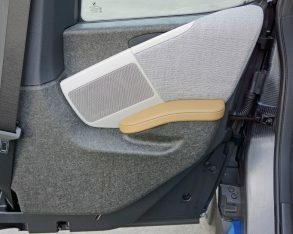 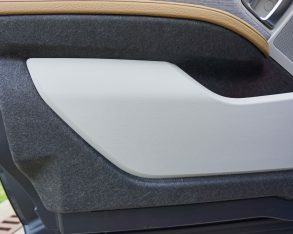 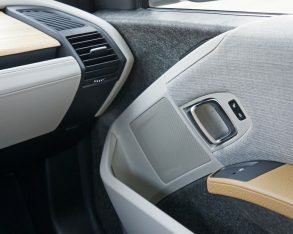 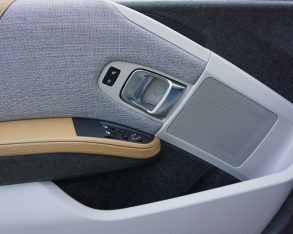 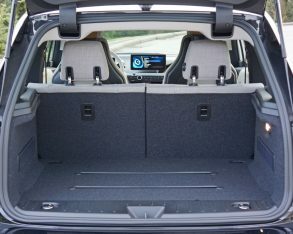 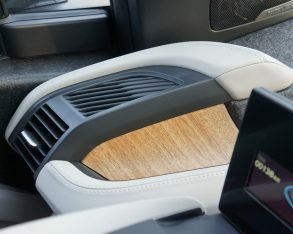 with the i3’s rigid carbon-fibre passenger compartment BMW added most of its usual active and standard safety gear to the i3 as well, resulting in the highest possible rating of five stars in the Euro NCAP crash tests, matching the protection of the best conventionally powered vehicles in its segment. 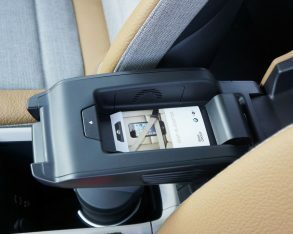 in Canada or the US with no roaming or data charges; Advanced Real Time Traffic Information services; Concierge Services with live assistants to help you plan your trip; and Convenience Telephony with Smartphone Connectivity. 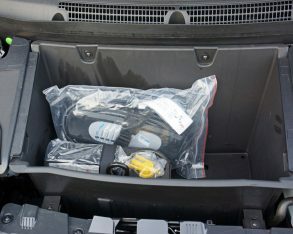 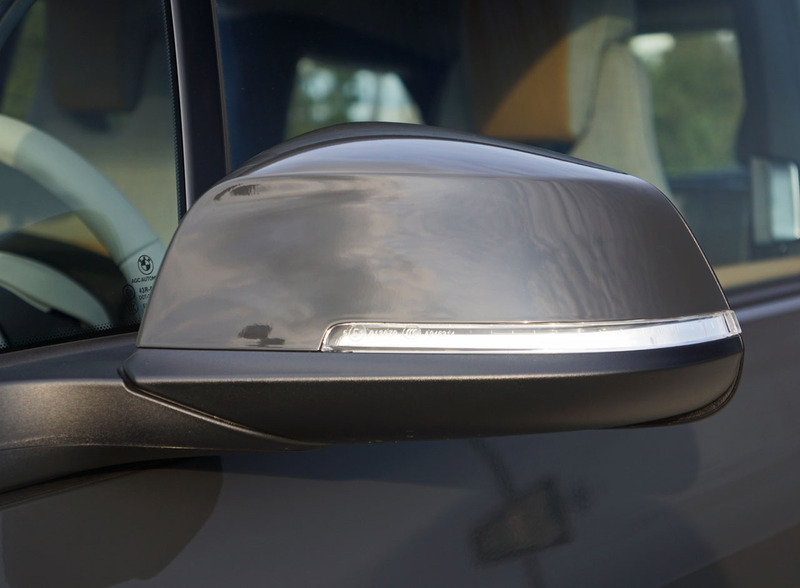 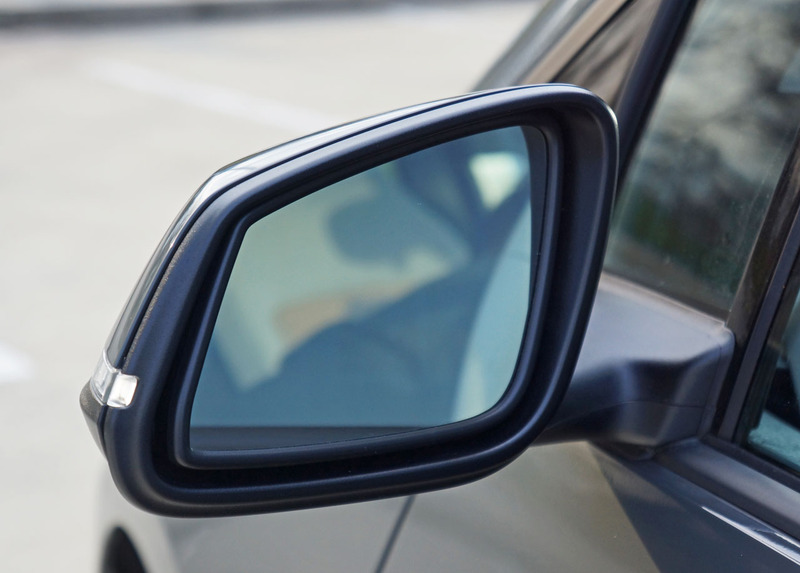 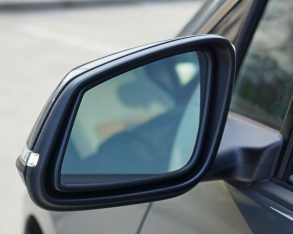 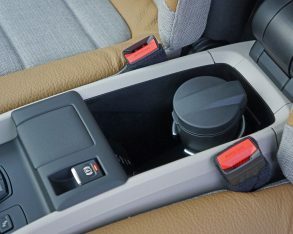 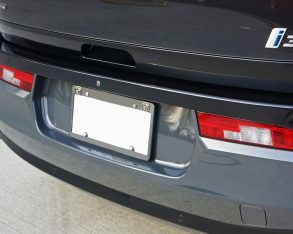 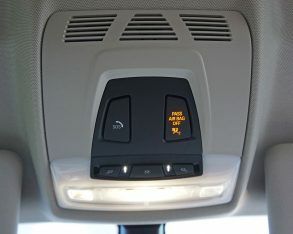 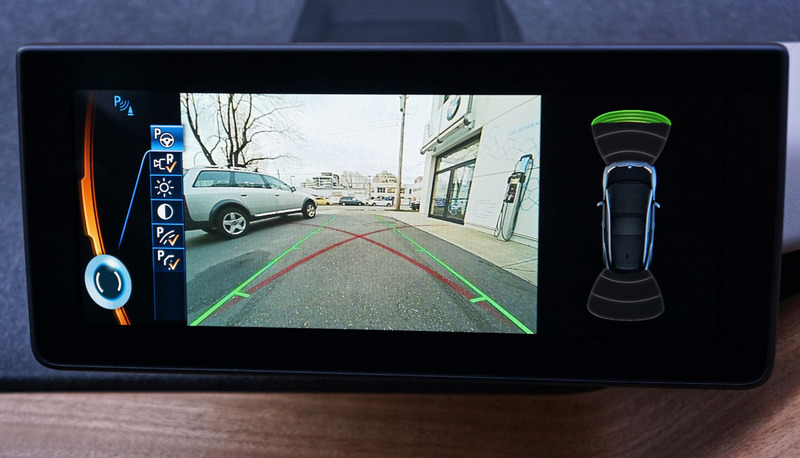 The Technology Package is also available with as-tested Lodge trim, the latter requiring $3,600 over and above Loft trim while including everything the base model offers plus proximity-sensing Comfort Access, Navigation Services Professional, satellite radio, auto-dimming interior and side mirrors, a universal remote garage door opener, an alarm system, and the Park Assistant Package that includes front and rear sonar, a rear camera, the capability of detecting suitable parallel parking spaces, and parking assistance. 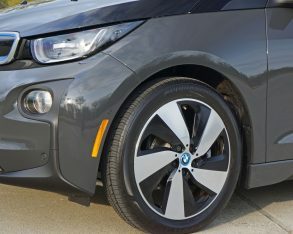 unique 19-inch Turbine wheels, while the Technology Package and DC fast charging system are still optional. 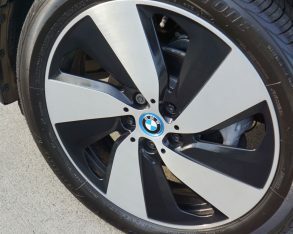 Additionally, a sportier set of 20-inch Double Spoke rims is available across the line for $1,300. 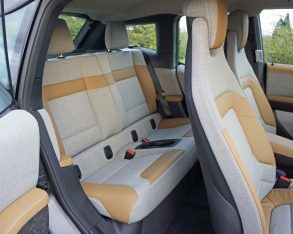 I really could go for those wheels as they look fabulous, but I’d take a pass on top-line Suite trim because I love the unique look of the Lodge interior I tested. 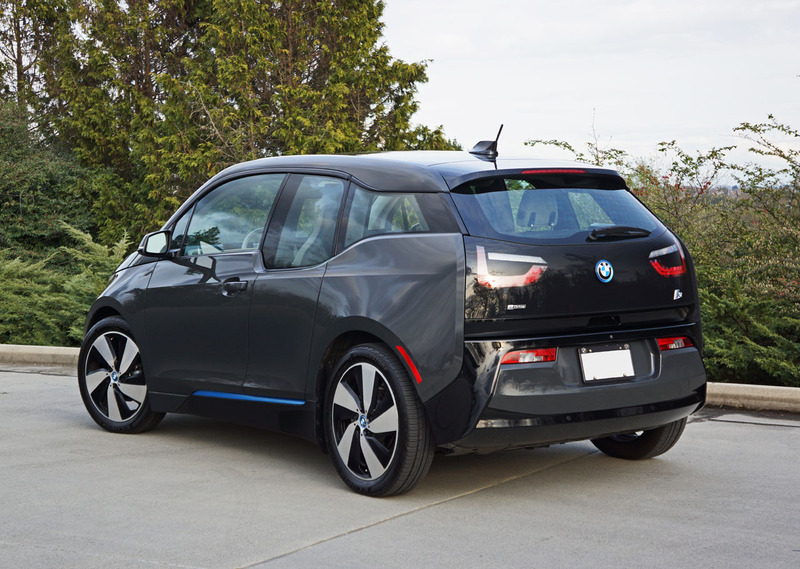 Living in the heart of my city wouldn’t require the need of the range extender engine either, although having it when needed does add to the i3’s flexibility. 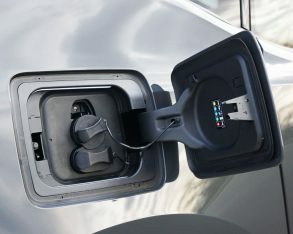 The fast charging DC system is a must, however, and I’d be tempted to go for the Technology Package for the audio upgrade alone, although the base system was quite good. 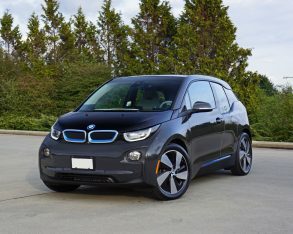 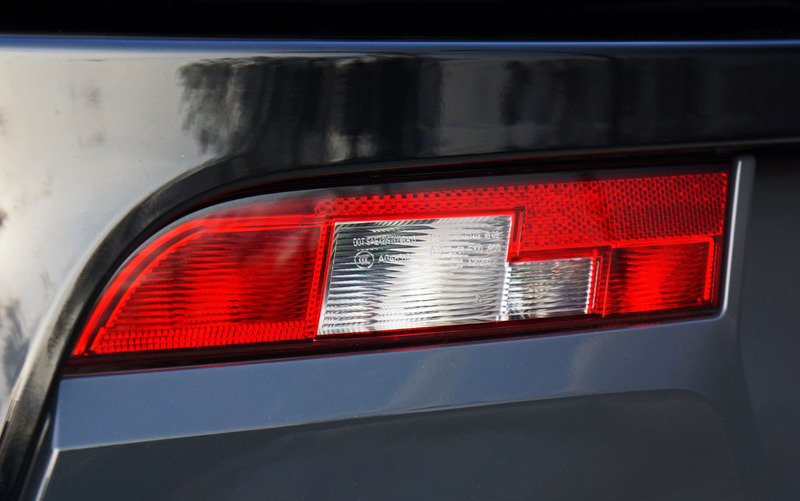 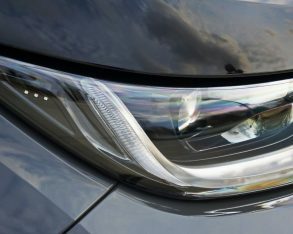 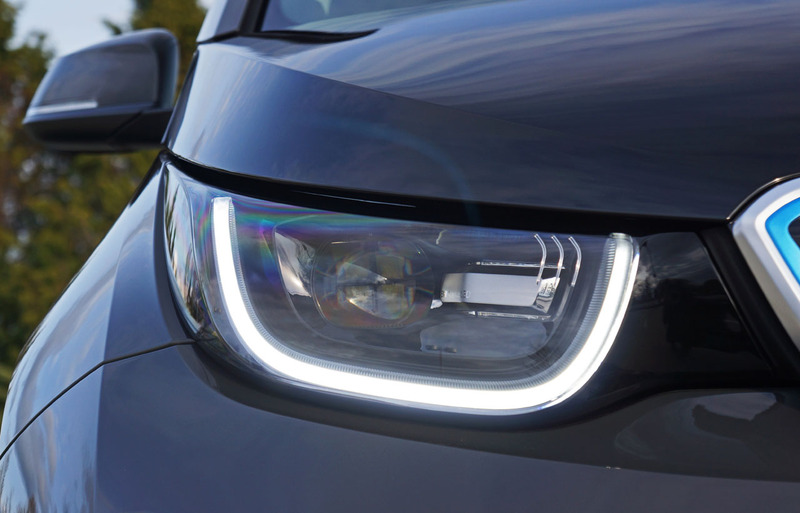 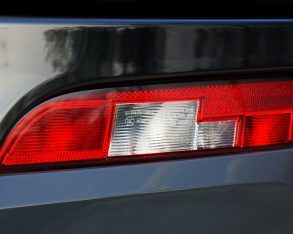 on where you live in Canada you may be eligible to get some of your hard earned tax money back if you buy a plug-in electric like the i3, with rebates ranging from $5,000 in BC to $8,500 in Quebec. 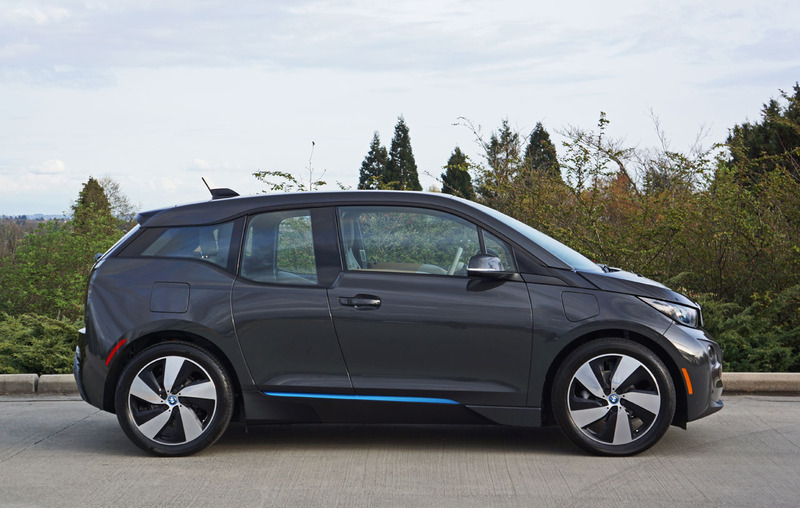 That goes a long way to making the BMW i3 more affordable. 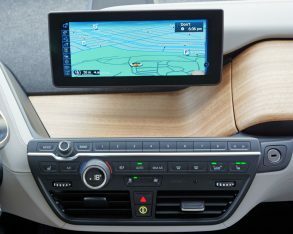 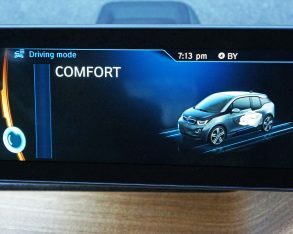 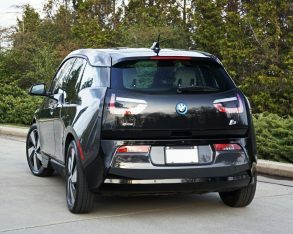 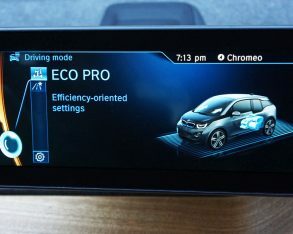 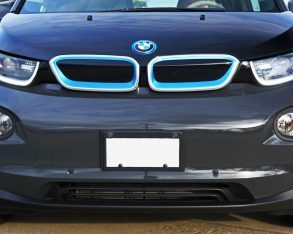 As it was, my Lodge equipped i3 with its Range Extender engine and DC fast charging system was priced at $53,300 before freight, while a fully loaded i3 with Suite trim and Technology Package will set you back $56,800, either number not bad for a car with the technology of an F1 racer capable of whipping an M3 to 20 km/h. 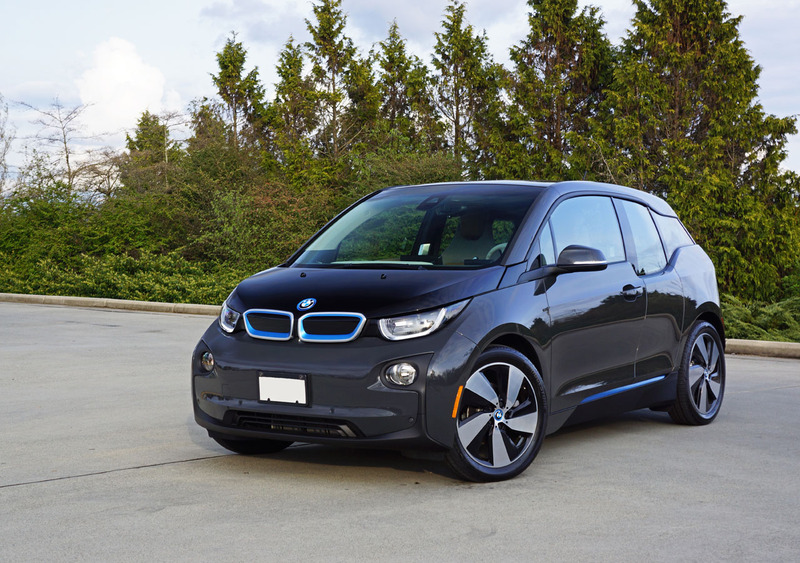 i3 was good enough to win the 2015 Green Car of the Year Award, an impressive feat, not to mention many other awards as well as praise from the majority of auto writers including yours truly. 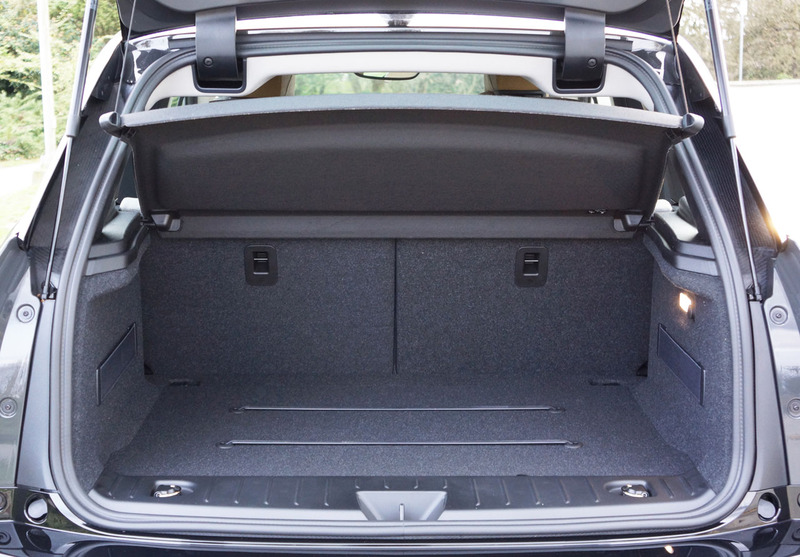 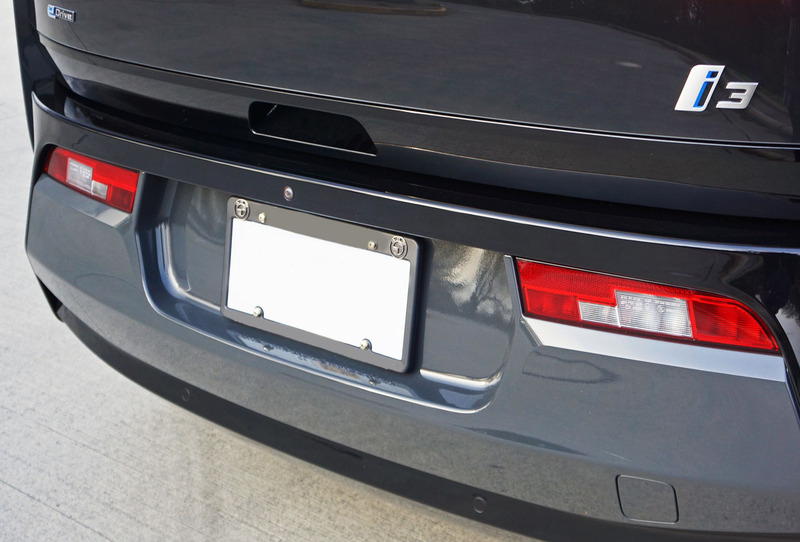 It’s a car that suits my inner city lifestyle perfectly, while more than enough fun to drive and amply practical for hauling around life’s gear as well as weekend getaways and trips up the mountain with ski gear in back. 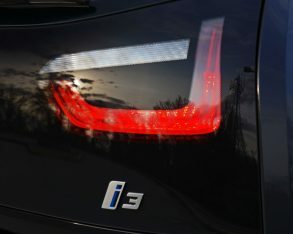 You’ll get a different kind of respect from an i3 than an M3, with thumbs up from passersby that are even more enthusiastic.